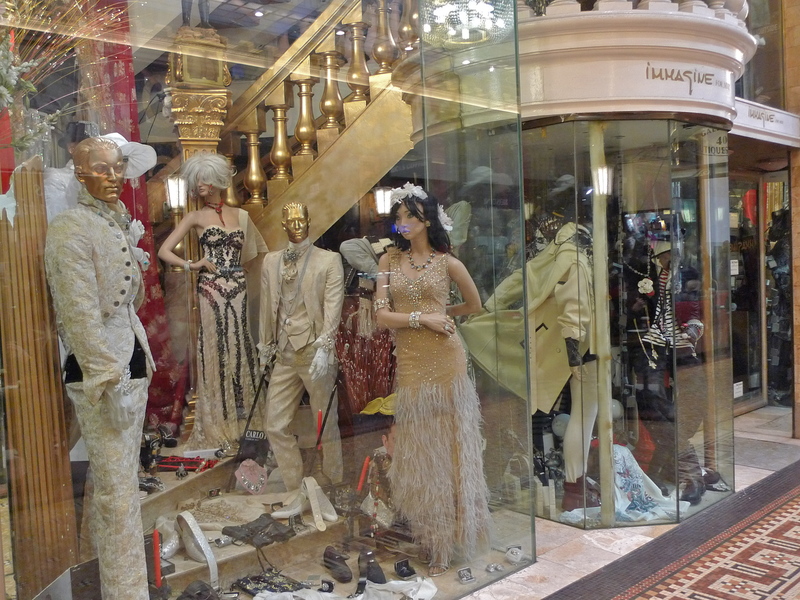 OF ALL THE PARISIAN passages couverts that sprang up mainly in the first half of the nineteenth century, the Galerie Vivienne was perhaps the most fashionable. 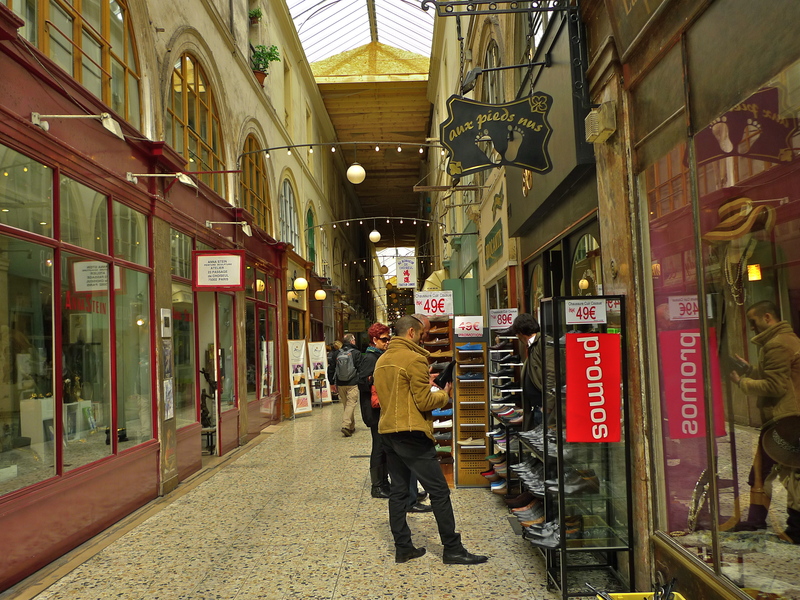 The passages couverts, or covered passages, were an early form of shopping arcade concentrated either in the fashionable area around the Palais Royal, the Boulevard des Italiens and the Boulevard Montmartre, or around the less fashionable rue Saint-Denis. Of the one hundred and fifty original passages couverts, only twenty now remain and I’ve been to all of them to record and archive their contemporary soundscapes for my Paris Soundscapes Archive. The Galerie Vivienne was built in 1823 by the Président de la chamber des Notaires, maître Marchoux. Marchoux lived at N°6 rue Vivienne and he built the Galerie Vivienne around his house and three adjoining properties he acquired, including the former stables of the duc d’Orléans, and a terraced house and garden overlooking the rue des Petits-Champs. The French architect, and winner of the prix de Rome in 1778, François-Jean Delannoy was commissioned to design and build the passage. His design successfully turned an irregular ‘L’ shaped, slightly inclined passage into a remarkably attractive shopping arcade while integrating the existing buildings. The Galerie Vivienne was opened for business in 1826. It boasted seventy boutiques including a tailor, a boot-maker, a wine merchant, a restaurant, a haberdashery, a confectioner, an engravings dealer, a hosier and a glassblower. The gallery also hosted the Cosorama, where one could view scenes of distant lands and exotic subjects through optical devices that magnified the pictures and the Unanorama, where you could observe the stars. The Empire style decoration inside the galerie combines arches, pilasters and cornices. The high glass ceilings are embellished with friezes representing the symbols of success (crowns of laurels, sheaves of corn and palms), of wealth (horns of plenty) and commerce (the caduceus of Mercury). The Italian mosaic artist, Giandomenico Facchina, created the mosaic floor. 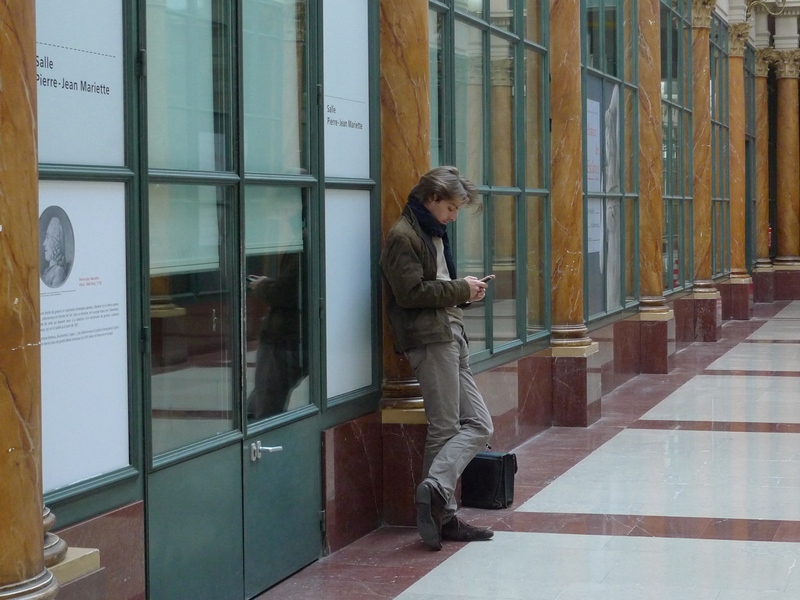 These are the contemporary sounds inside the Galerie Vivienne, recorded a few days ago. But we do have a record of the impression the nineteenth century sounds of the galerie made on one person: the composer, Hector Berlioz. With the coming of the retail revolution in the mid-nineteenth century, the new department stores springing up across the city signaled the demise of all of the Parisian passage couverts. When Hermance Marchoux, daughter of maître Marchoux, died in 1870 the Galerie Vivienne was bequeathed to the Institut de France, but by 1897 the gallery was deserted and in 1903 it faced the prospect of demolition. It did manage to survive though although it wasn’t until the 1970s and the revival of interest in the architectural heritage of the passages couverts, that it gradually returned to life. Kenzo held a fashion show in the galerie in 1970 and then, a little later, more fashion shops began to appear. It was the arrival of Jean-Paul Gaultier in 1986, which established the Galerie Vivienne once again as a place of Parisian high fashion. 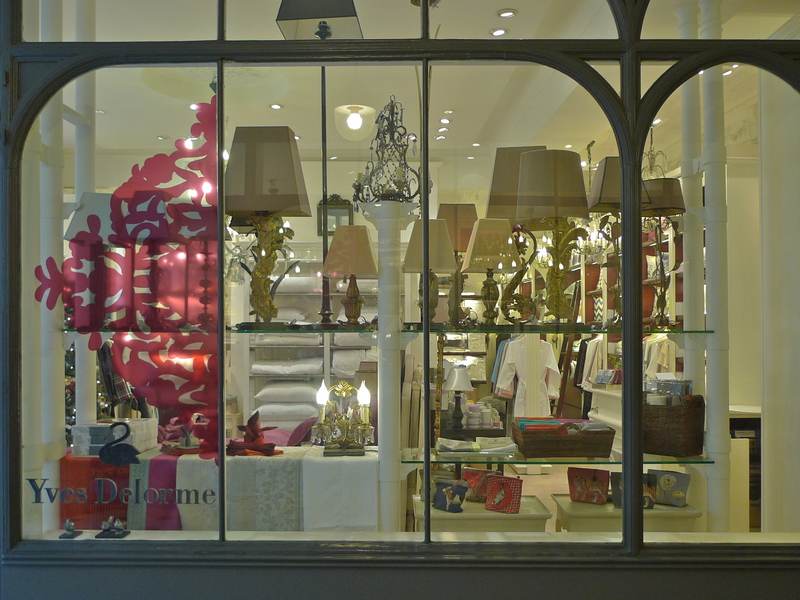 The lustre of the Galerie Vivienne had returned. 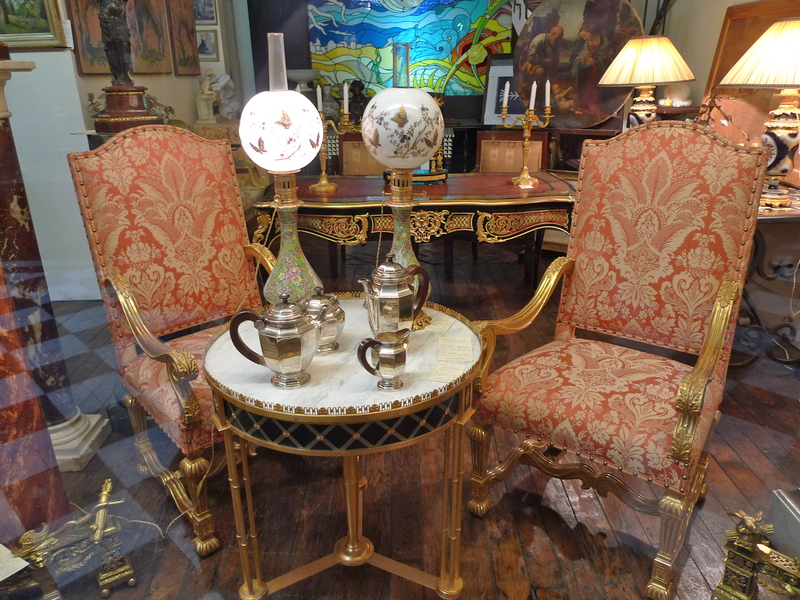 Two of the boutiques in today’s Galerie Vivienne have a long pedigree. 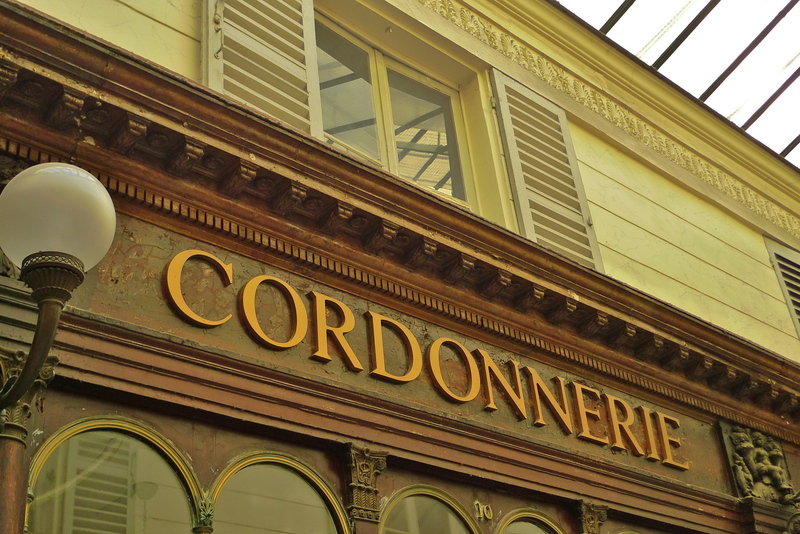 The wine merchant, arguably one of the best in Paris, Lucien Legrand Filles & Fils is one of the longest established boutiques in the galerie, still occupying its original position. 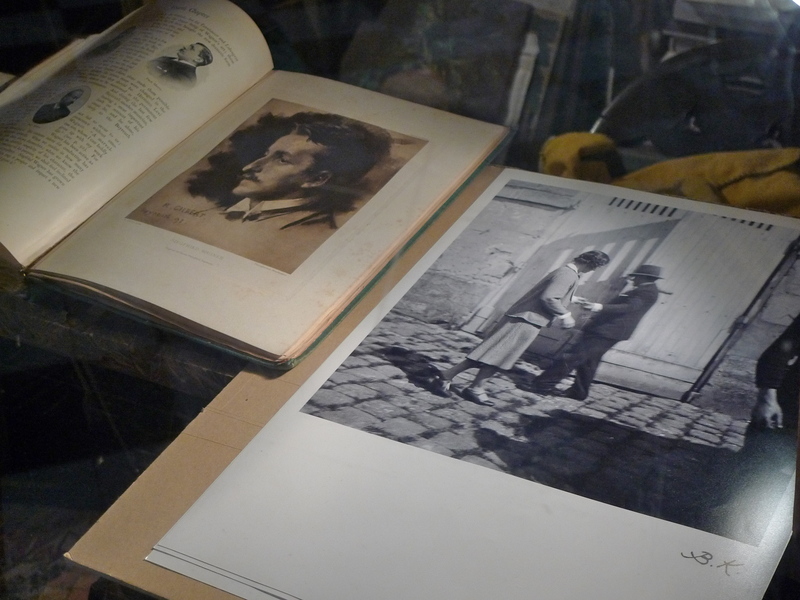 The oldest surviving boutique can be found at N° 45 Galerie Vivienne: the Librairie Jousseaume. 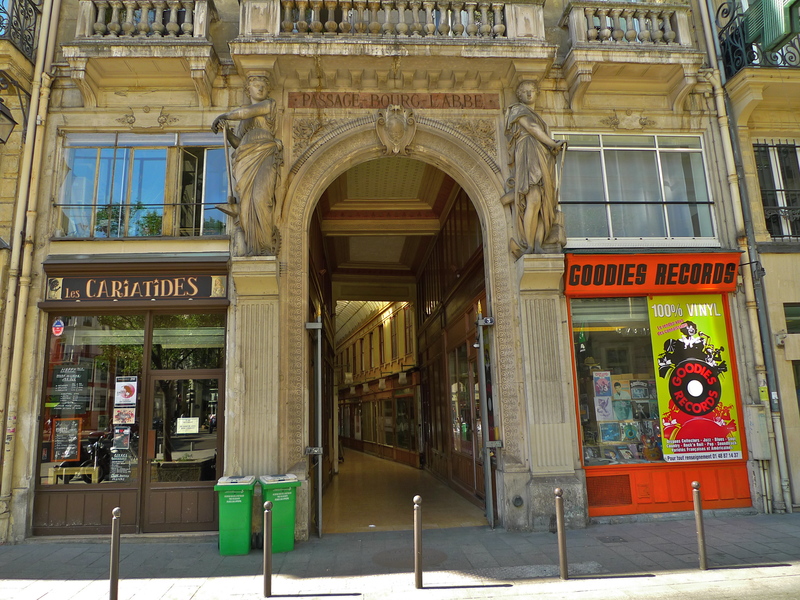 Established in 1826, some say this is the oldest surviving bookshop in Paris. The bookshop was bought in 1900 by M. Petit-Siroux who then bought the boutique opposite, at N° 46. Located between the Palais Royal, the Paris Bourse and the Grands Boulevards, the Galerie Vivienne lies at the heart of fashionable Paris. Despite coming close to destruction at the turn of the nineteenth century, the galerie now boasts prestigious labels and quality artisans that link both past and present. The sumptuous architecture, delicate mosaics and grand statues have been wonderfully preserved, and the shops and restaurants are seriously chic and expensive! THE PASSAGE DU PONCEAU may not be the oldest, the largest or the most elegant of the nineteenth century passages couverts in Paris but at least it has survived. Of the one hundred and fifty original passages couverts built, only twenty now remain and I’ve been to all of them to record and archive their contemporary soundscapes for my Paris Soundscapes Archive. Built as an extension to the neighbouring Passage du Caire in the 2nd arrondissement, the Passage du Ponceau was opened in 1826. Originally intended to link rue Saint-Denis to rue du Ponceau, the length of the passage was reduced in 1854 to make way for the new boulevard Sébastopol. At ninety metres long and just two-and-a-half metres wide, the Passage du Ponceau is a narrow passage comprising two floors under a glass roof. Little remains of the original decoration save for the upper reaches of the façades and some of the mouldings. We know that two of the original tenants to occupy the Passage du Ponceau were a wine merchant and a coal merchant but no evidence of their presence survives. Today, the passage is mainly occupied by clothing and media enterprises: it is after all in the heart of the multicultural textile and garment district, which has increasingly become home to many Internet start-up companies. 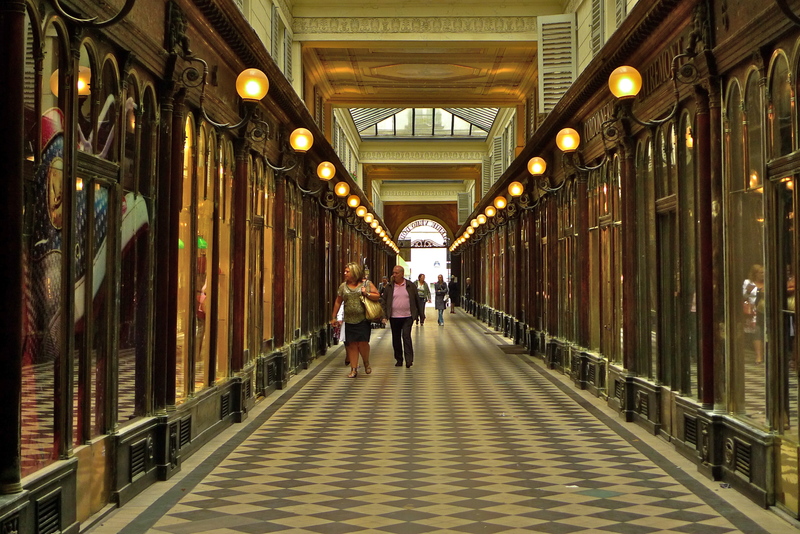 THE GALERIE COLBERT is one of the surviving examples of the Parisian passages couverts, the nineteenth century covered arcades built on the Right Bank of the Seine. 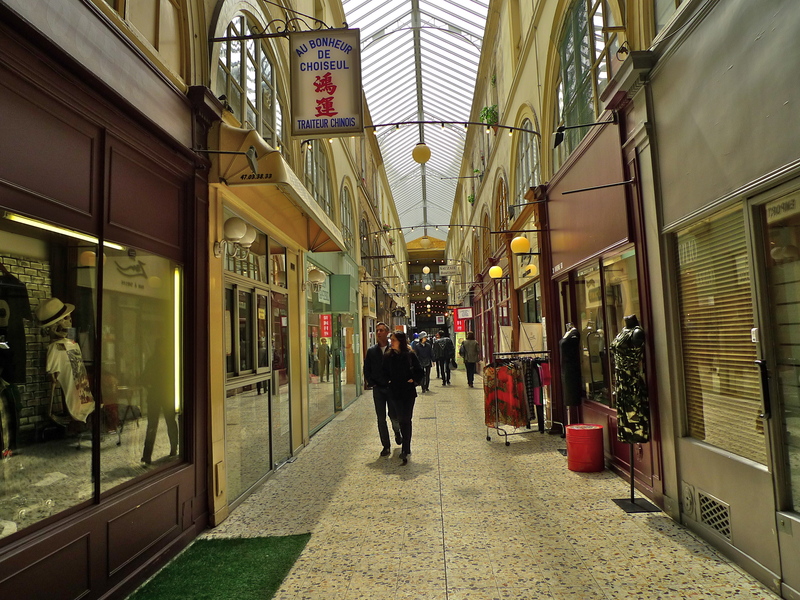 The passages couverts were an early form of shopping arcade that sprang up mainly in the first half of the nineteenth century. Most of them were concentrated either in the fashionable area around the Palais Royal, the Boulevard des Italiens and the Boulevard Montmartre, or around the much less fashionable, rue Saint-Denis. 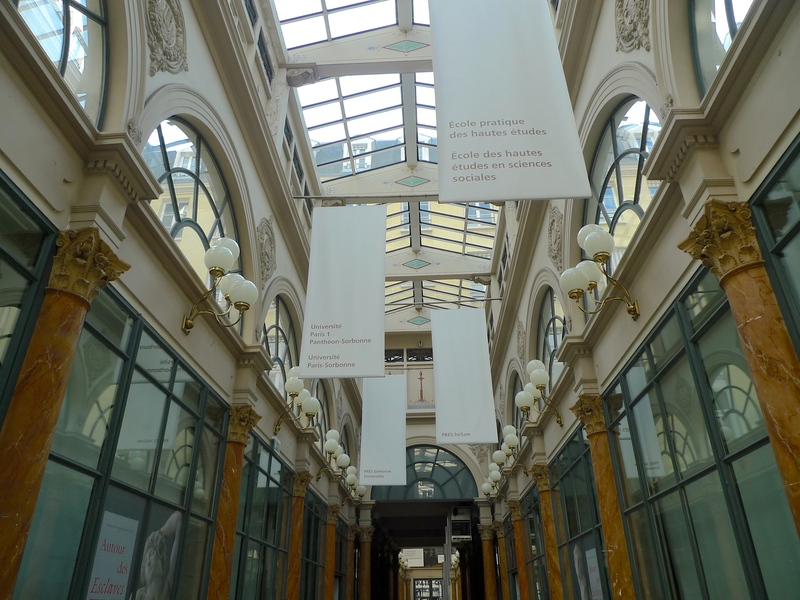 Like most of the passages couverts, the Galerie Colbert began as a speculative venture. The story begins I suppose with Cardinal Richelieu, who in 1634 built the Palais-Cardinal, subsequently the Palais-Royal, the seventeenth century social centre of the capital. Richelieu’s palace paved the way for the development of the surrounding area including l’hôtel Bautru at the corner of the rue Petits-Champs and rue Vivienne. L’hôtel Bautru was designed by the French classical architect, Louis le Vau, with the aide of the master mason, Michel Villedo. It was built for Guillaume Bautru, a protégé of Richelieu. In 1665, l’hôtel Bautru became home to l’Intendant des finances et superintendant des bâtiments du Roi, Jean-Baptiste Colbert, finance minister under Louis XIV. With a change of occupant came a change of name, the building became l’hôtel Colbert. In subsequent years, l’hôtel Colbert saw a succession of occupants; for a time it housed the stables of Philippe d’Orléans, regent of France during the minority of Louis XV, and from 1806 until 1825 it was la Caisse de la dette publique, the public debt commission. 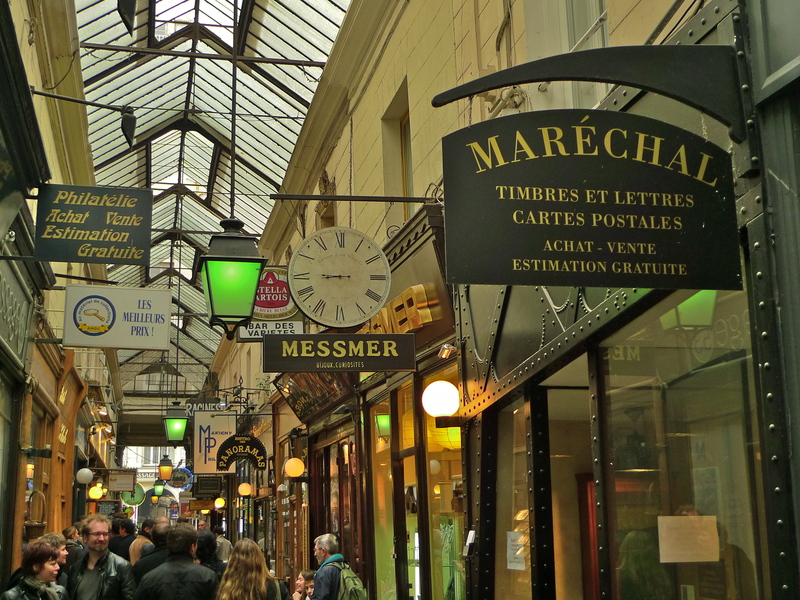 By the early nineteenth century, passages couverts were beginning to appear in Paris. Highly ornamented and decorated covered arcades with a collection of boutiques under one roof, away from the mud of the streets and indifferent to the weather and with light pouring in through their glass roofs in the daytime and illuminated by gas lamps at night, these arcades were a new concept and they were attracting customers – lots of them. In 1825, the Galerie Vivienne opened. It was, and still is, the doyen of the Parisian passages couverts. A company of speculators, Adam et Cie, saw an opportunity. They bought the l’Hôtel Colbert and engaged the architect, Jacques Billaud, to design and build an arcade cheek by jowl with the Galerie Vivienne. 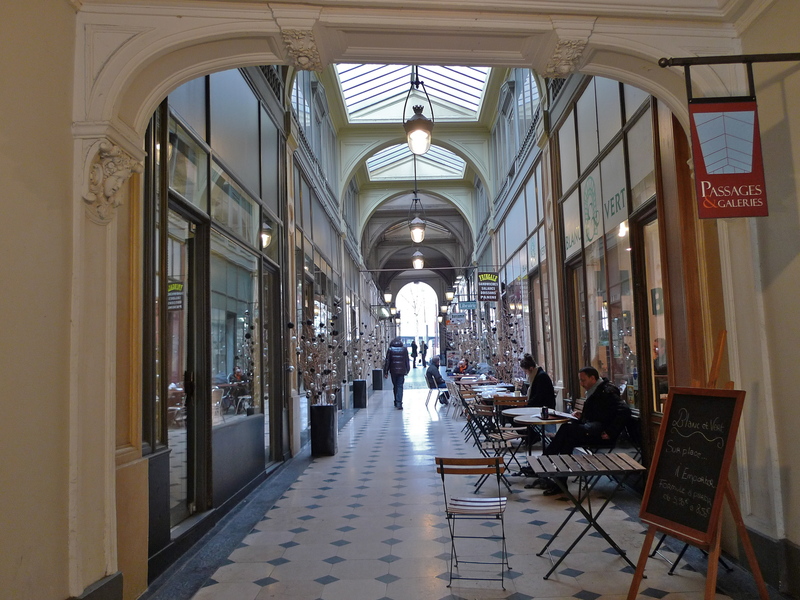 With a nod to the last occupants of the Hôtel Colbert, the arcade was to be called le passage du Trésor but eventually the name Galerie Colbert was settled upon and it was opened in 1827. The Galerie Colbert may have been competing for customers with the neighbouring Galerie Vivienne but architecturally it secured its place as an equal. Billaud’s design included a main passage lined with boutiques surmounted by a glass roof supported by a series of triangular pediments. The polychromatic decoration included columns made from yellow marble with red marble bases and a veined grey marble frieze. 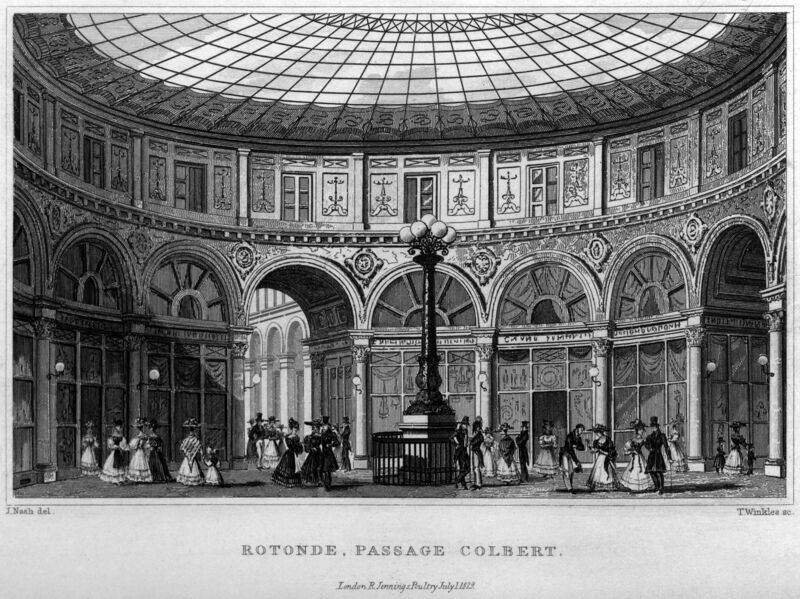 Undoubtedly, the centrepiece of the Galerie Colbert was the great rotunda, a sumptuous fifteen metre diameter glass dome. Under the dome stood a bronze candelabrum supporting a ring of seven crystal globes lit with gas. This ‘Cocotier Lumineux’, or ‘luminous coconut tree’ as it was known became the foremost destination for romantic trysts under the July Monarchy. It has since disappeared and been replaced by Charles-Françcois Leboeuf’s statue, Eurydice mourante. At No. 28, M. Bouis, hernia truss supplier and manufacturer of belts preventing masturbation for children of all ages. There is mention of the Colbert Pharmacy, whose flagship products included ‘stomach pills’ and ‘sarsaparilla essence’ – a cure for ‘sores, scabs, rheumatic and gouty pains, acrid blood, black humour and melancholy … and syphilis’. Other sources report a hairdresser, tailors, seamstresses, milliners, a glove maker, a quill pen merchant, a music publisher and reading rooms with French and English newspapers. Mme. Brigitte Mathé reportedly had a bookshop with 15,000 volumes and the ‘complete collections of the principal authors’. In the 1830s a novelty shop opened, Au Grand Colbert, later to become a famous restaurant, Le Grand Colbert, which still exists. As a means of attracting customers, and keeping the children amused, a Géorama, an aerial trompe l’oeil, was installed at the main entrance. All the passages couverts faced the same problem – the tide of progress, and in the mid nineteenth century the tide was unstoppable. The main means of mass transportation in the early nineteenth century was the stagecoach and most of the passages couverts were built close to a stagecoach terminus in order to capture potential customers waiting for or alighting from stagecoaches. The coming of the railways in the mid nineteenth century ensured the demise of both the stagecoach and the potential customers. 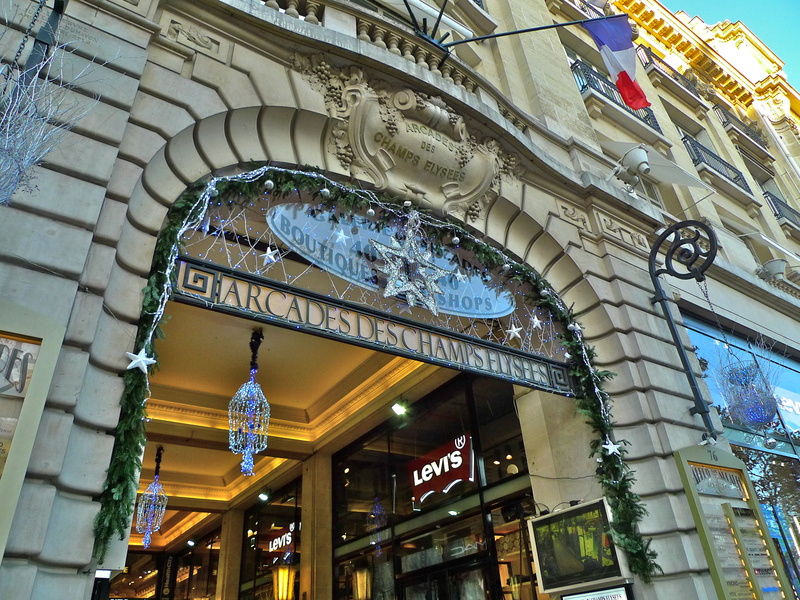 Progress in the form of Baron Haussmann’s redevelopment of Paris consumed some of the passages couverts but it was the mid nineteenth century seismic revolution in shopping – the birth of the department store, that signalled the end of the road for the passages couverts. 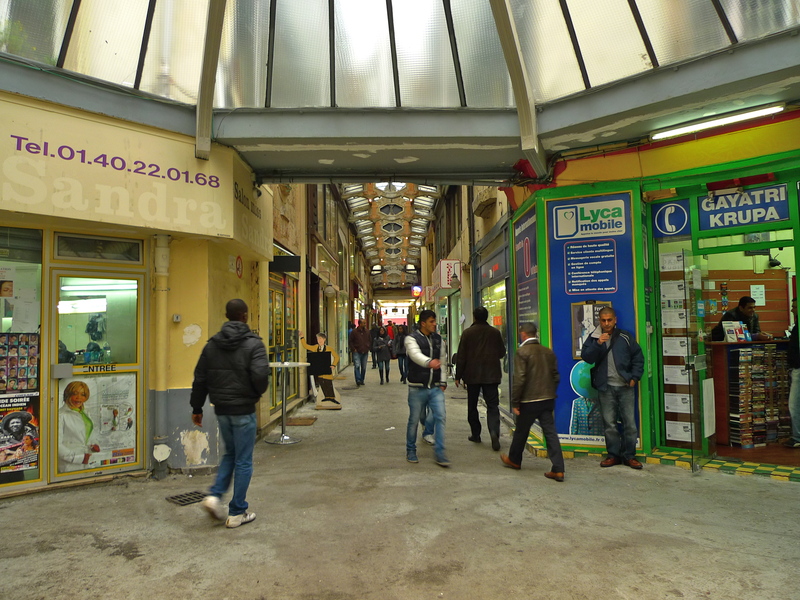 These arcades, a recent invention of industrial luxury, are glass-roofed, marble-panelled corridors extending through whole blocks of buildings, whose owners have joined together for such enterprises. Lining both sides of the corridors, which get their light from above, are the most elegant shops, so that the arcade is a city, a world in miniature, in which customers will find everything they need. The mid nineteenth century department store revolution saw Aristide Boucicaut’s Au Bon Marché, Ernest Cognacq’s La Samaritaine, Jules Jaluzot and Jean-Alfred Duclos’ Printemps and Albert Kahn and Théophile Bader’s Galeries Lafayette become retail giants, taking the arcades’ world in miniature, in which customers will find everything they need and replicating it on an industrial scale. Faced with all this progress the Galerie Colbert inevitably began a painful decline. Abandoned by its customers and by its traders, by 1890 it had become almost deserted. 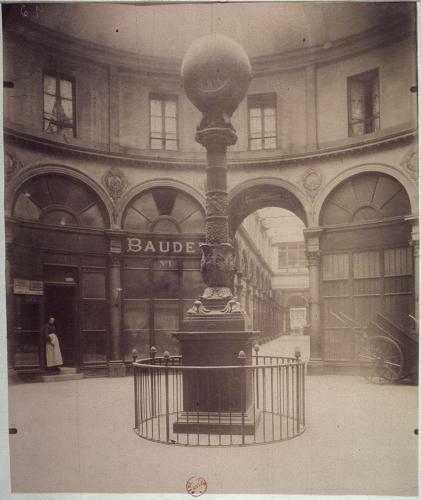 Eugène Atget’s 1906 photograph illustrates this; the lustre and even the candelabrum with its seven crystal globes has gone – the romantic trysting place is no more. 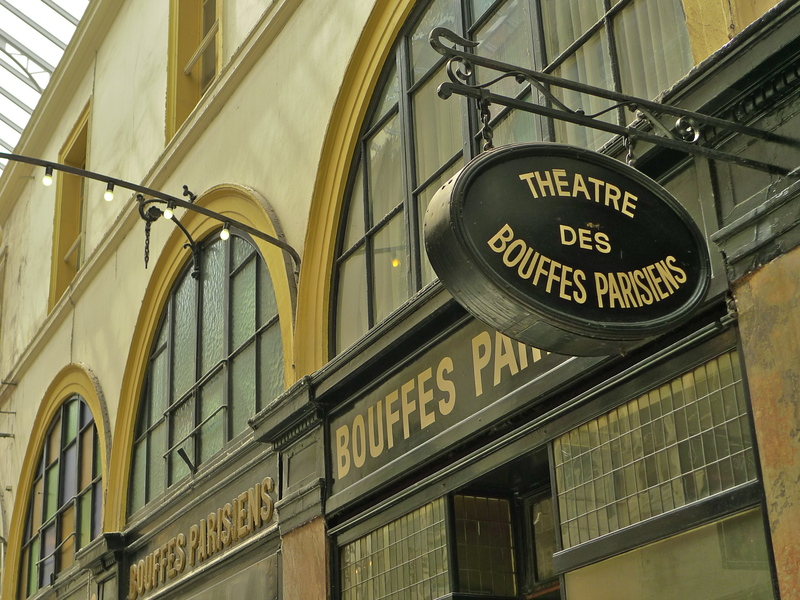 In 1916, the Commission du Vieux Paris declared that the Galerie Colbert and the neighbouring passages couverts were ‘meurent d’anémie commerciale’, dying of commercial anaemia. It took a while but a renaissance was to come. 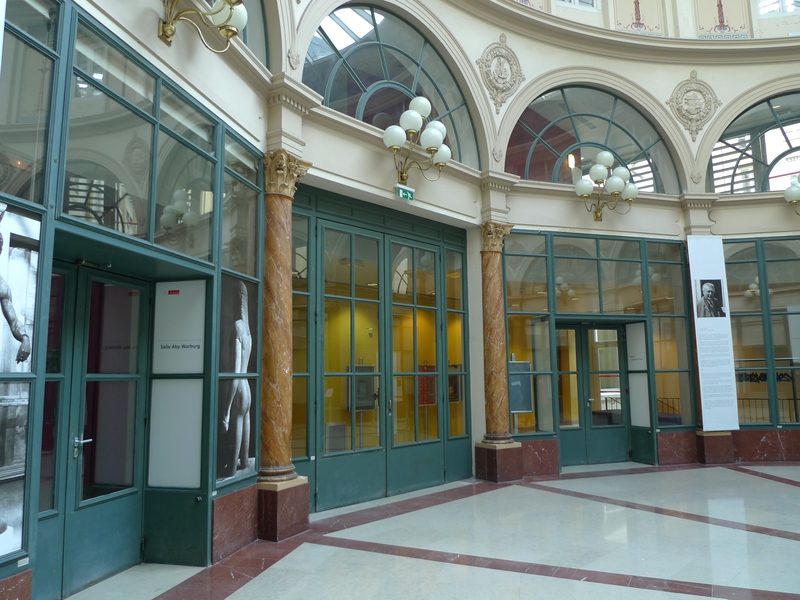 In the 1970s there was a revival of interest in nineteenth century architecture and in 1974, the Galerie Colbert was declared a monument historique. In the early 1980s it was bought by the Bibliothèque Nationale de France who commissioned its restoration. The gallery was in such a state of disrepair that it had to be partly demolished before any reconstruction could begin. 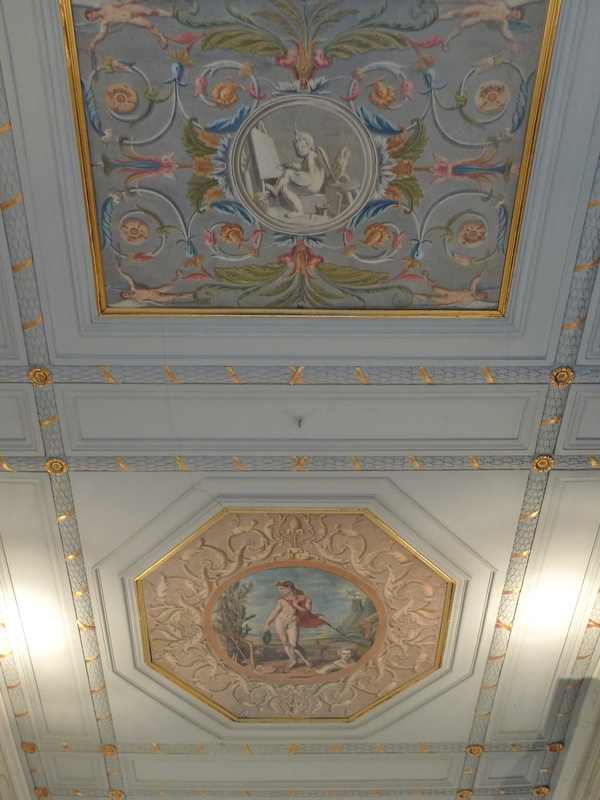 The work was supervised by the French architect, Louis Blanchet, who ensured that the flamboyant pastiche we see today is a true representation of the original Galerie Colbert. In 1996, the Institut National d’Histoire de l’Art moved in and between 1999 and 2004, the architects, Dominique Pinon and Pascale Kaparis, were commissioned to redesign some of areas around the historic passage and rotunda. 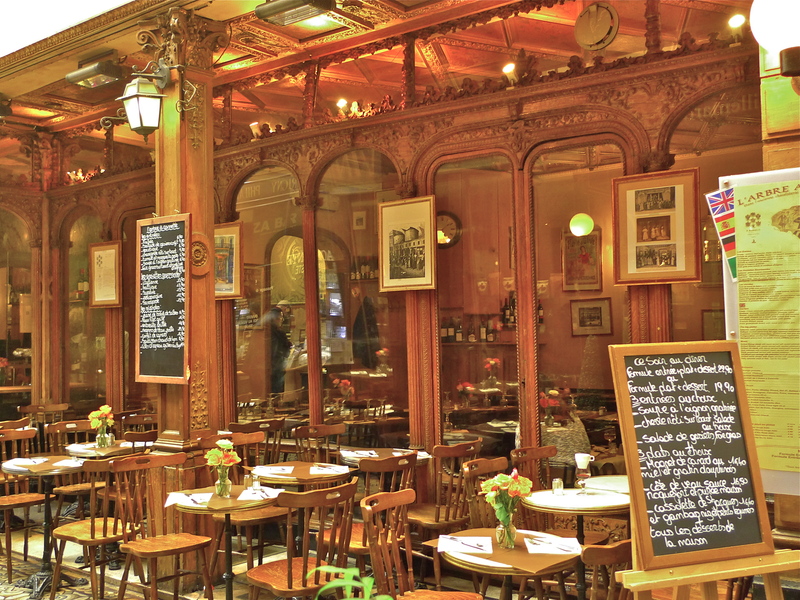 There are no boutiques in the Galerie Colbert today, save of course for Le Grand Colbert restaurant. Instead, the spaces once occupied by the eclectic band of traders are now meeting rooms. 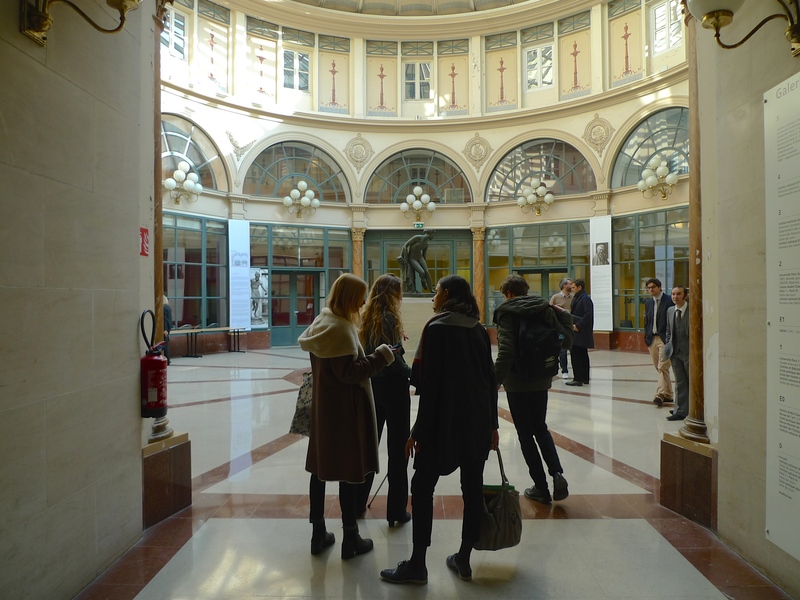 As well as the Institut National d’Histoire de l’Art, the Galerie Colbert is also home to the Institut national du patrimoine and various other cultural organisations as well as providing research facilities for several Paris universities. One hundred and fifty passages couverts were built in Paris, most of them between 1823 and 1847, but only twenty survive today. I have recorded sounds in all the surviving passages and one part of my Paris Soundscapes Archive is dedicated to their sounds. Since we cannot listen to the sounds of these passages couverts in their hey-day, I think it important that their contemporary sounds be preserved as insurance against the day when even they may face ‘meurent d’anémie commerciale’. 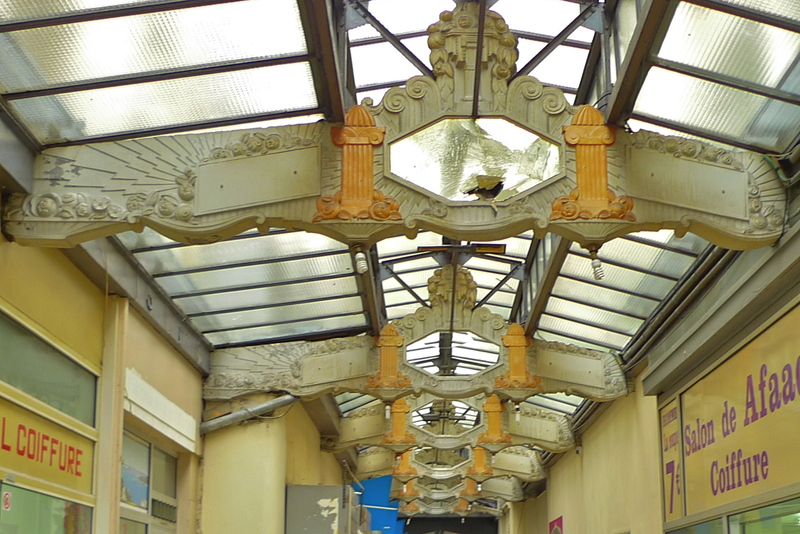 FOR SOME TIME NOW I’ve been exploring the history of and recording the contemporary sounds inside the surviving Parisian passages couverts, the covered shopping arcades, which were at their zenith in the early 19th century. In all, some 150 passages couverts were built mainly in the area between the Palais-Royal and the Grands Boulevards and in the former industrial area around Saint-Denis. In the second-half of the 19th century with the demise of the stagecoach, the opening of railway stations, urban redevelopment by Baron Haussmann, and the creation of department stores the fate of the passages couverts was sealed and they largely fell into disrepair, disuse or disappeared altogether. In the middle of the 20th century a wave of enthusiasm emerged to rescue and renovate the surviving passages. Of the original 150 that were built, 20 still survive today and most of those have been restored to their former glory. The 1820’s and the 1830’s really marked the hey day of the passages couverts but, despite their subsequent decline, a hundred years later a new passage was to appear, a passage equally as elegant as the best of its early 19th century predecessors. Léonard Rosenthal (1875 – 1955) was a French businessman, diamond merchant, and property developer. In 1924, Rosenthal acquired a property on the Champs Elysées that had been built originally for the department store owner, Georges Dufayel. 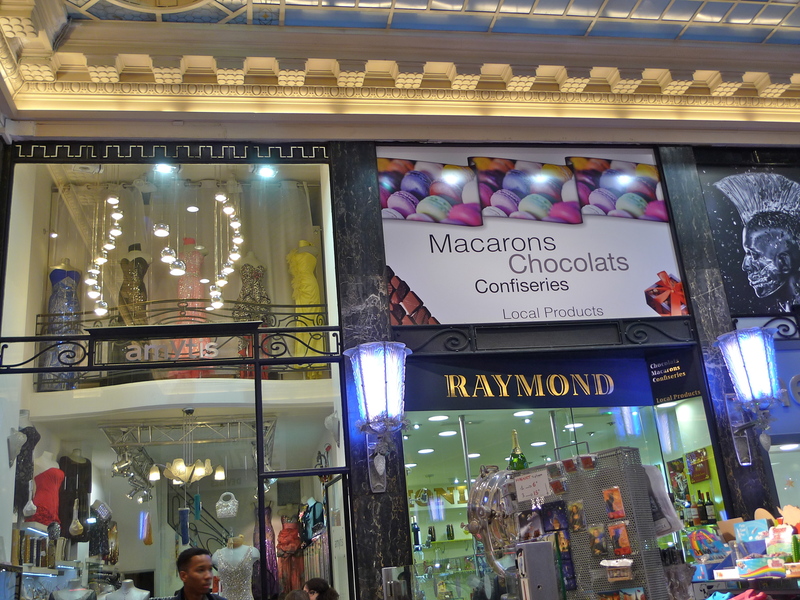 It was on the site of this property that Rosenthal was to create a new passage couvert – the Arcades des Champs Elysées. The French architects, Charles Lefebvre, Marcel Julien and Louis Duhayon designed the 120 metres long, 15 metres wide, Arcades des Champs Elysées in a mixture of Art Deco and neo-classical styles. Eight of the Scottish granite columns came from the old Hôtel Dufayel, to which were added eight more in red granite originally surmounted by gold capitals. A facing of blonde and black marble covers the walls. 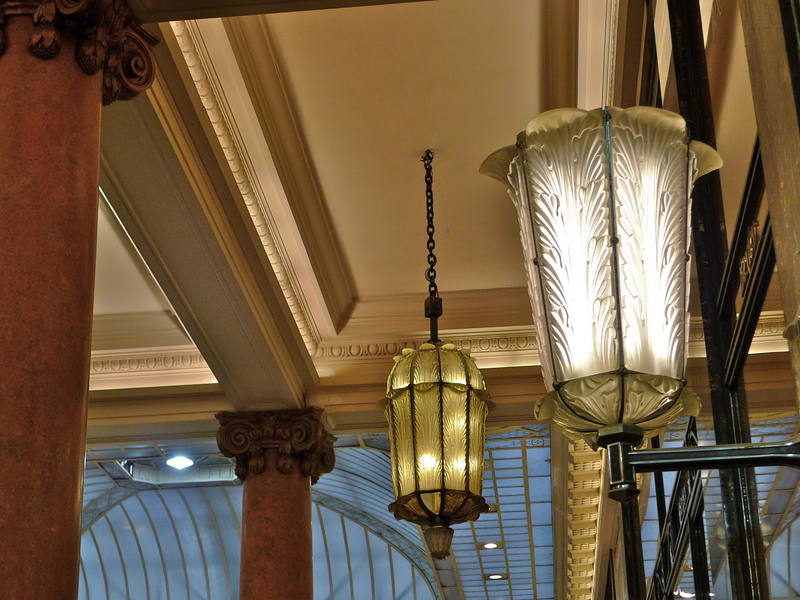 The decoration inside the arcades was created by some of the top craftsmen in their field – the wrought iron work by René Gobert, the stained glass by Fernand Jacopozzi and the light fittings and shades by René Lalique. 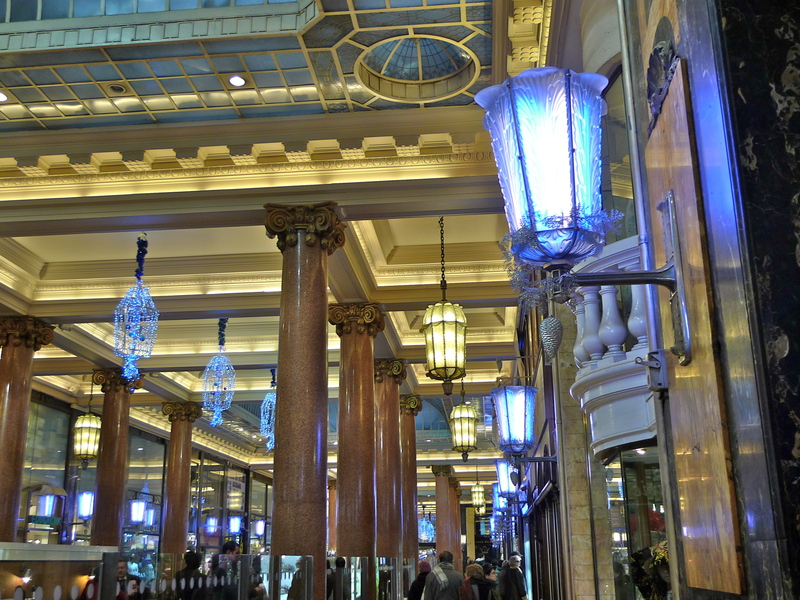 The arcade was designed with a central space containing a café with a terrace and a bandstand surrounded by an array of two-floor boutiques. The boutiques are still there, the café is now a Starbucks and the bandstand has disappeared. And that’s not the only thing that has disappeared. Two fountains designed by René Lalique have gone, one to the Tokyo Museum and one to the United States and two lanterns that framed the entrance on the Champs Elysées mysteriously vanished. 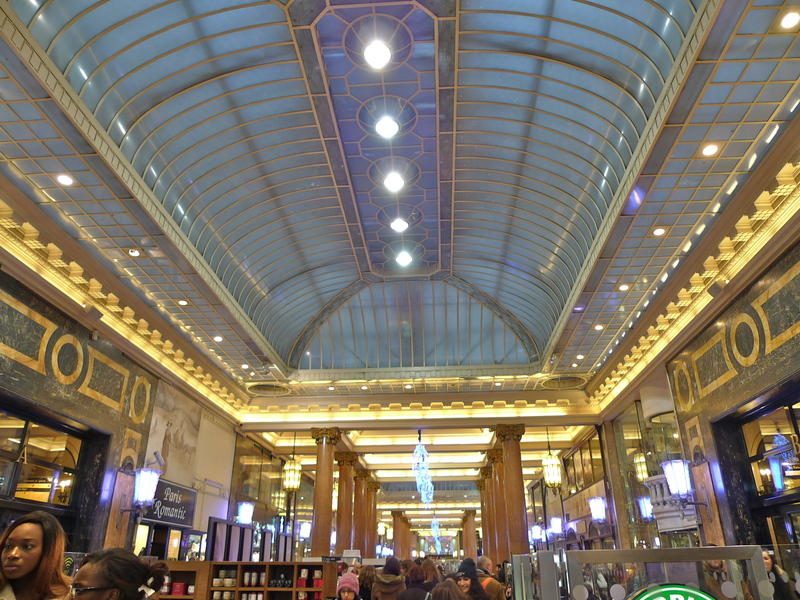 For me, the most spectacular feature of the Arcades des Champs Elysées is the magnificent glass roof. 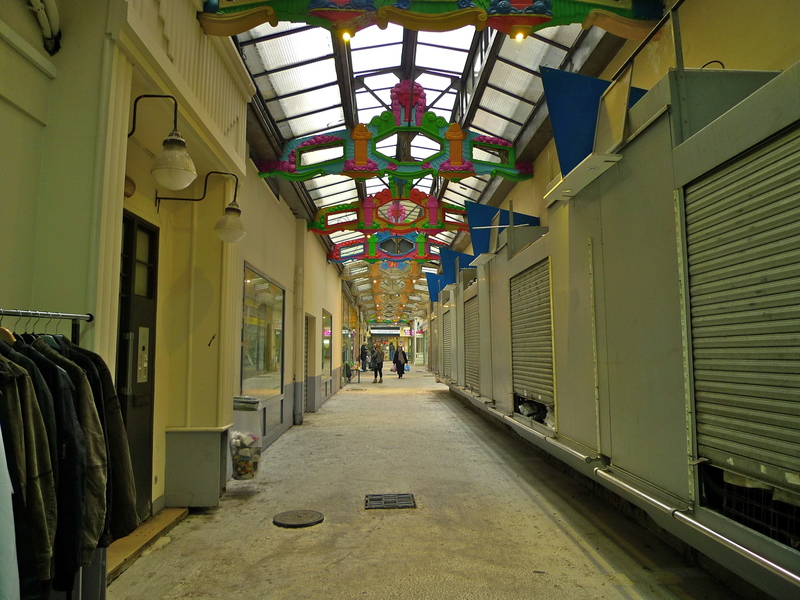 I’ve been to the Arcades des Champs Elysées many times but the other day I went specifically to record the sounds inside to add to my Paris Soundscapes Archive. My sound recording actually began before I entered the arcade because, completely by chance, I happened upon a group of African male dancers performing in the street outside. They were a lively bunch and they had attracted quite a crowd but I didn’t stay for their complete performance, instead I left them to it and I went to record the contemporary soundscape inside the arcade. The sounds I captured on this particular Thursday afternoon were not as elegant as their surroundings and not as delicate as the sounds I’ve captured in some of the other surviving passages couverts. That is partly to do with the general hubbub emanating from the Starbucks emporium but it’s also a feature of the size and shape of the arcade. Long, narrow arcades seem to highlight and amplify the most delicate sounds but in the 15 metre wide Arcades des Champs Elysées with its high glass roof and coffee shop in the centre, the sounds seem to tend towards the cacophonous rather than the elegant – pretty much like all the other sounds in the Champs Elysées. Still, the sounds are what they are and consequently I think they are worth preserving. Visitors to Paris may be familiar with the famous Parisian nightspot, the Cabaret Lido, which is a little further along the Champs Elysées. 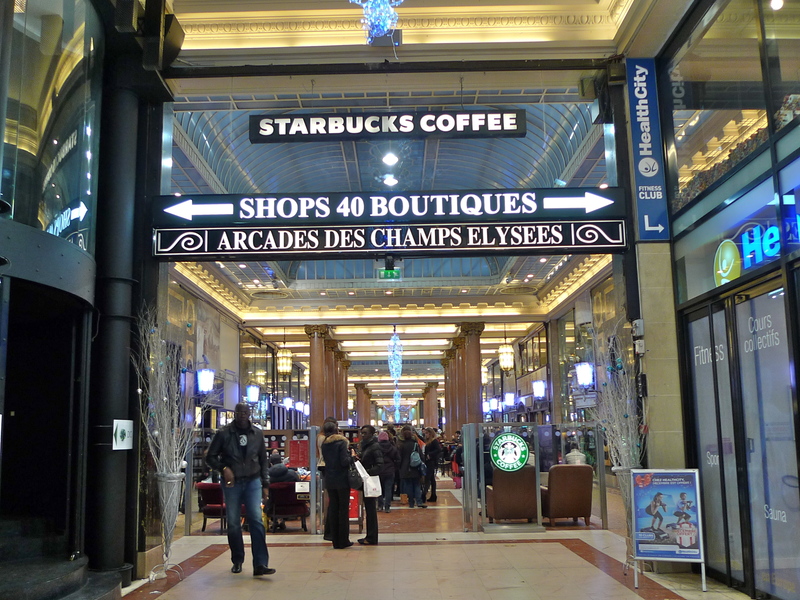 What the visitors may not know is that the nickname for the Arcades des Champs Elysées is the Arcades du Lido. And the reason for that is that the Cabaret Lido was situated in the Arcades des Champs Elysées from 1946 until 1977. 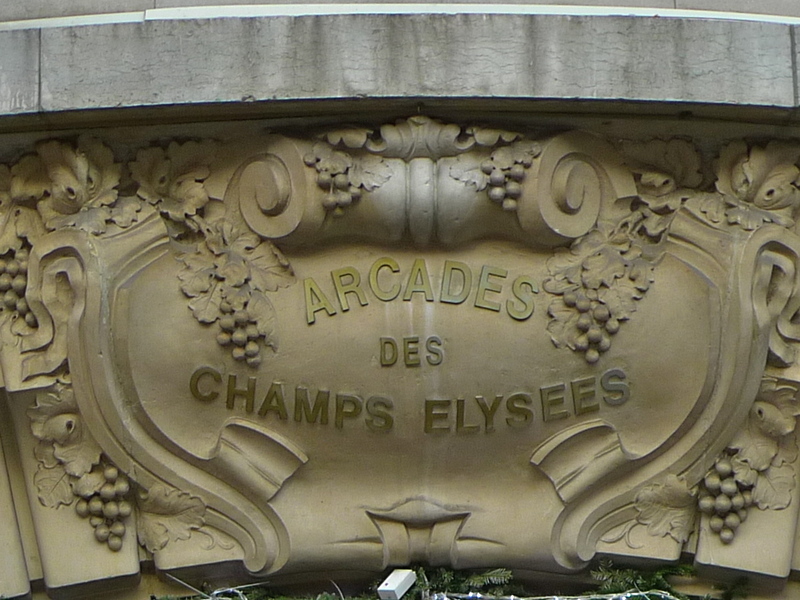 From 1929, one of the features of the Arcades des Champs Elysées was the underground health spa as we might call it these days, which was set up by the Société hydrothérapeutic et balnéaire des Champs Elysées. It occupied 4,400 M2 and comprised a heated swimming pool, a beauty salon, a hairdressers, a hammam, showers and a massage parlour. It was very fashionable and very popular. It was often referred to as The Paris Beach because the evenings had a Venetian theme reproducing the Lido Beach. Its success though was short lived. In 1933 the establishment went into liquidation and was closed. In 1936 the impresario, Leon Volterra took it on and replaced the swimming pool with an auditorium in which he put on diners-spectacles, dinner shows. In 1946, Joseph and Louis Clerico bought it from Volterra and completely transformed it into the Cabaret Lido. It went from strength to strength until finally in 1977 it was moved from the Arcades des Champs Elysées to larger premises just up the road where it remains today. For those of you who are perhaps not familiar with the Cabaret Lido, it’s probably best known as home to the famous dancing troupe, the Bluebell Girls. You can find more of my Passages Couverts collection by clicking here. 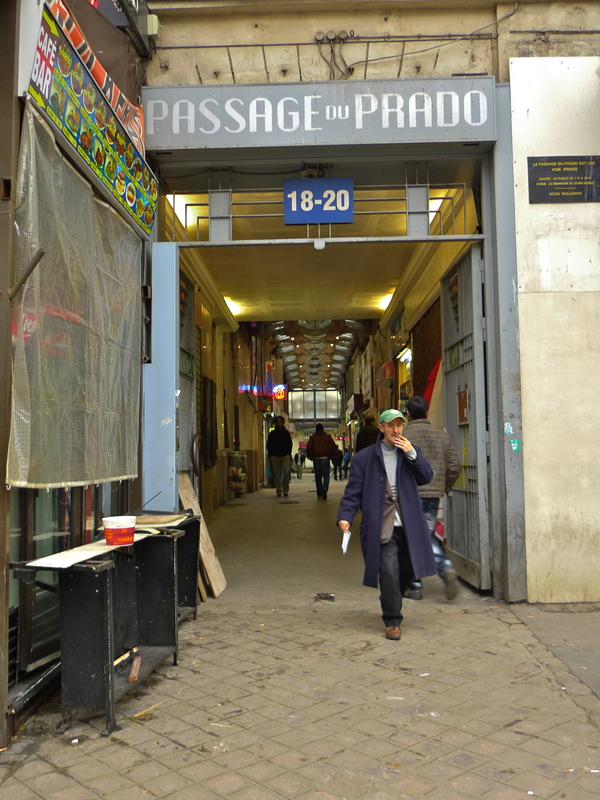 FOR SOME TIME NOW as part of my Paris Soundscapes project I’ve been recording and archiving the contemporary sounds in each of the twenty surviving nineteenth-century passage couverts in Paris. 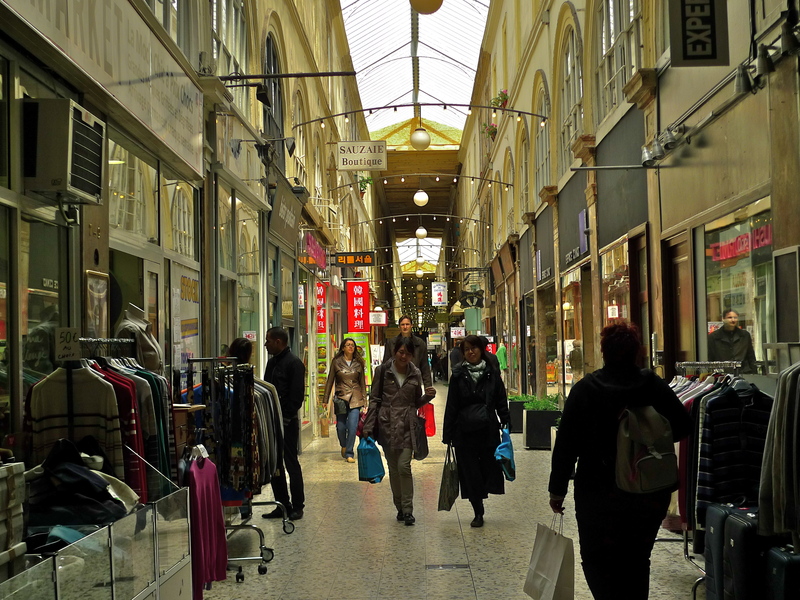 The Passage Choiseul in the 2nd arrondissement is latest of these passages to be added to my collection. Work began on the Passage Choiseul in 1825 and it took two years to complete. The architect, François Mazois, came up with the original design but he died before the work was completed and so another architect, Antoine Tavernier, took over. 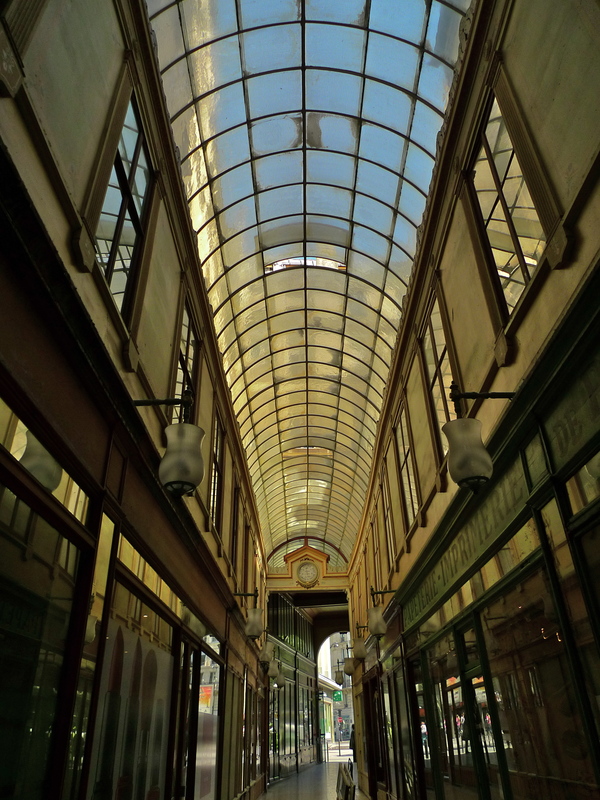 Like all the passages couverts, the Passage Choiseul resembles a street with two rows of boutiques on the ground floor with living accommodation above joined together by a glass roof. At 190 metres long this is the longest of the surviving passages couverts and it’s registered as an historic monument. The floor originally comprised grey sandstone floor tiles but they were covered over in the 1970’s with the speckled tiles we see today. 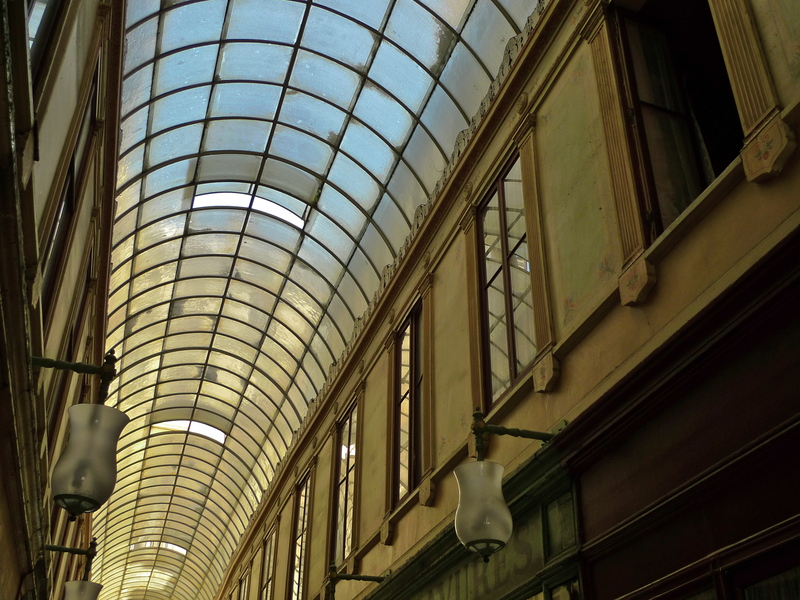 Like in so many of the passage couverts, the glass roof in the Passage Choiseul suffered over the years. It was replaced in 1907 but the ravages of time took a further toll and it once again descended into a sorry state. Recently, a young architect, Raphaël Bouchmousse, 32, came up with a proposal to renovate the roof at a cost of €740,000. The proposal was accepted and in May 2012 the work began. It’s now completed and the roof has returned to its former glory. 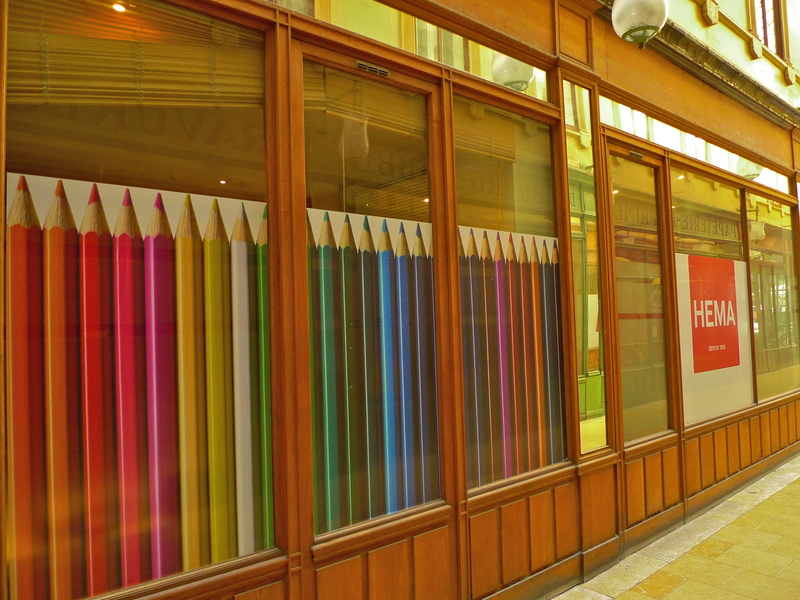 The Passage Choiseul has a long association with the arts. Anatole France, a French poet, journalist, novelist and winner of the Nobel Prize for Literature, worked here as a proof-reader from 1867 to 1876. Louis-Ferdinand Céline the French novelist, pamphleteer and physician, lived here as a child. His mother, Marguerite Destouches, owned a curiosity shop in the passage. Alphonse Lemeere published the first poems of Paul Verlaine from here in 1864 as well as the works of the Parnassians who embraced a French literary style that began during the 19th century. 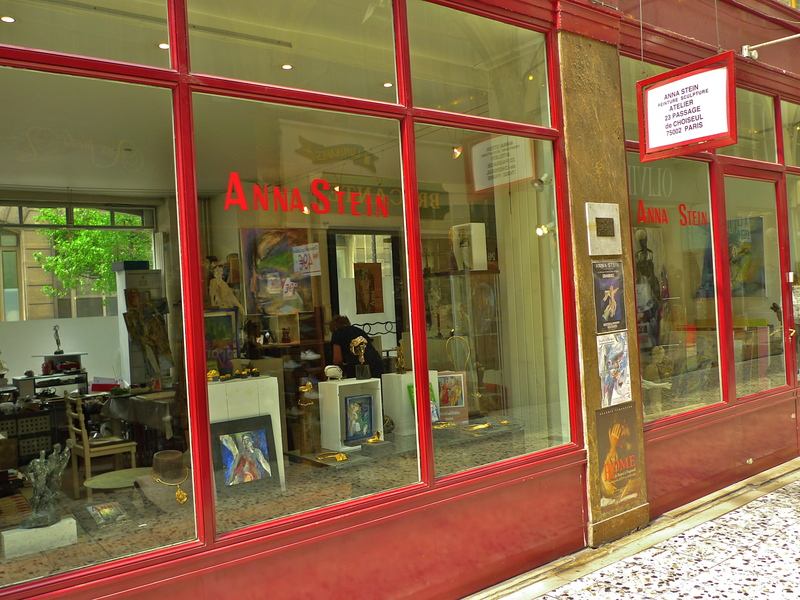 Today, the former publishing house of Alphonse Lemeere is occupied by the painter and sculptor, Anna Stein. Another occupant of the Passage Choiseul is the rear entrance to the Théâtre des Bouffes Parisiens. 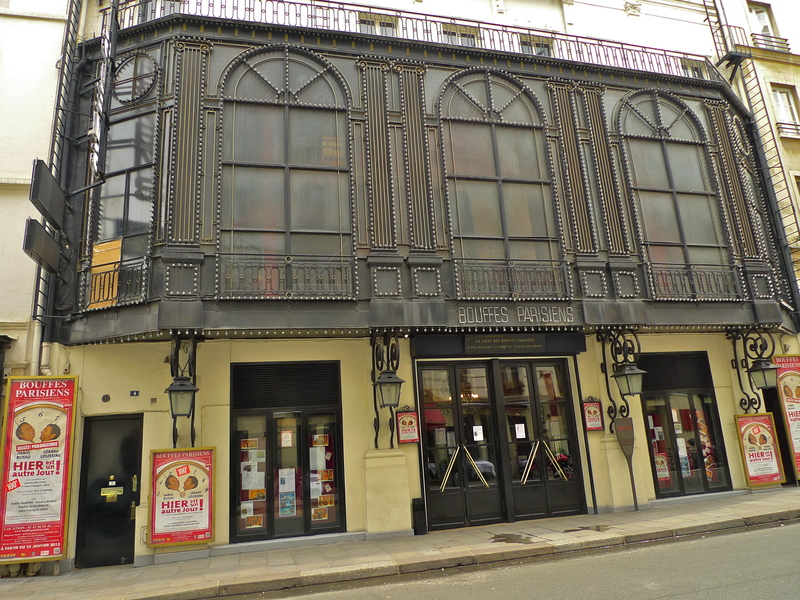 Inaugurated in 1855 by the composer Jacques Offenbach, the theatre was especially built to perform his opéra-bouffes. Orphée aux Enfers (Orpheus in the Underworld) was premiered here in 1858, La Belle Hélène in 1864 and La Vie Parisienne and Barbe-Bleue in 1866. The main entrance to the theatre is in the neighbouring street, rue Monsigny. 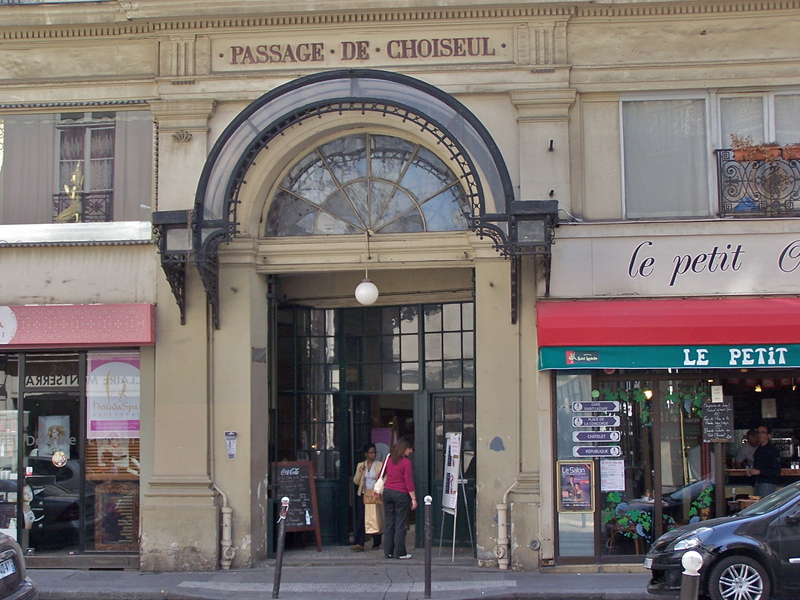 After early success, like all the other passages couverts the passage Choiseul entered a period of decline. Its fortunes were revived in the 1970’s when the French actress, Sophie Desmarets, opened an antique shop here, Cactus Bazar. 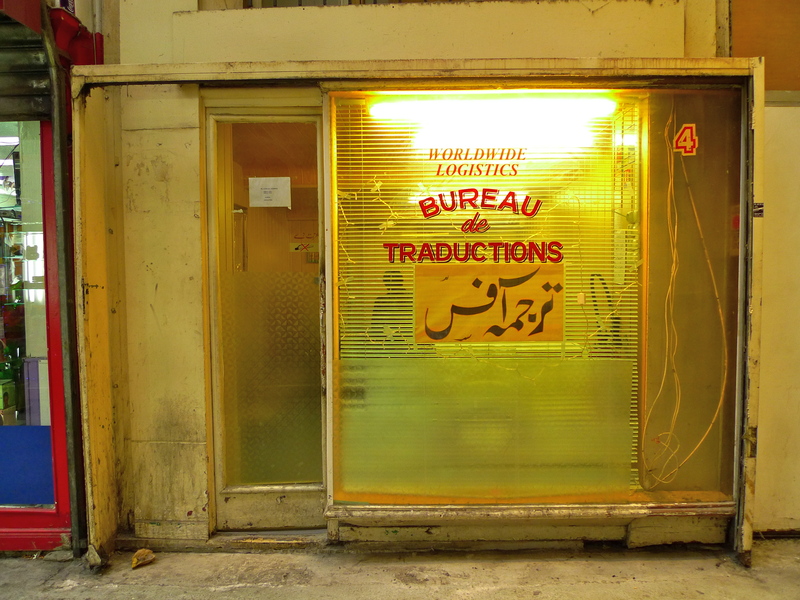 This was followed by Kenzo’s first fashion boutique, Jungle Jap, which has now moved to the Place des Victoires. 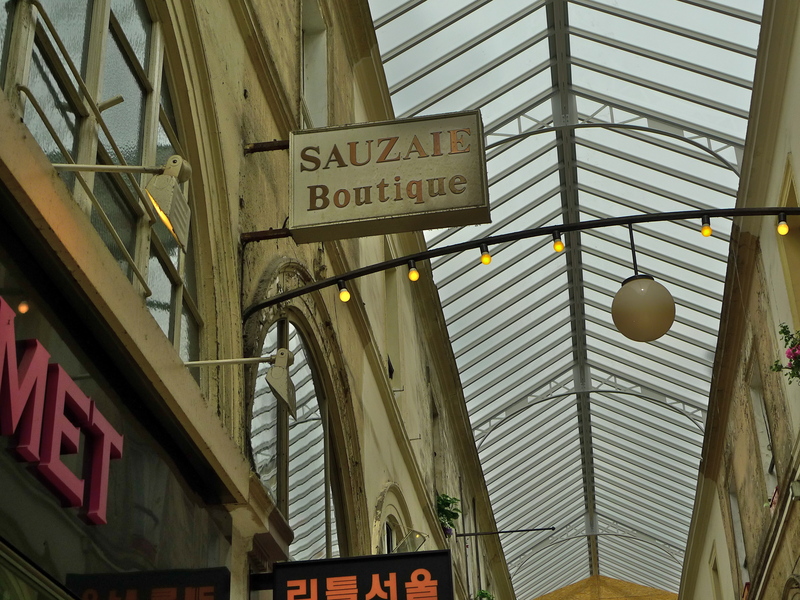 Today, the Passage Choiseul hosts Japanese eateries, clothing stores, jewellery shops, art galleries and art supply shops, as well as a plentiful supply of shoe shops. 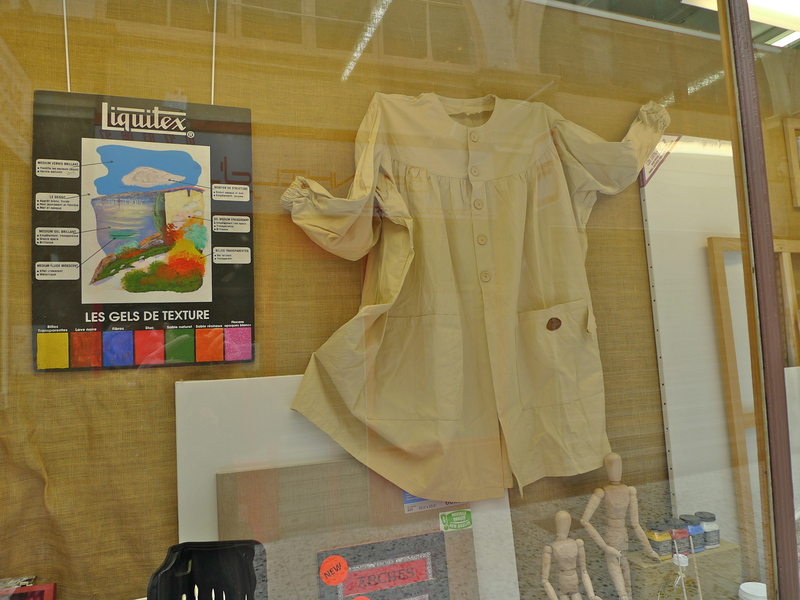 And you can see more of my collection of les passages couverts here. THE FRENCH ARCHITECT, Théodore Charpentier (1797 – 1867) specialised in designing theatres and restaurants. Amongst other things, he rebuilt the Opéra Comique after it was destroyed by fire in 1838, he designed the neo-Renaissance decor of the restaurant, “Trois Frères Provençaux”, in the Palais-Royal and he also built the Café Pierron. In 1842, he turned his attention to the Place de la Madeleine then, as now, an elegant and very expensive part of Paris. 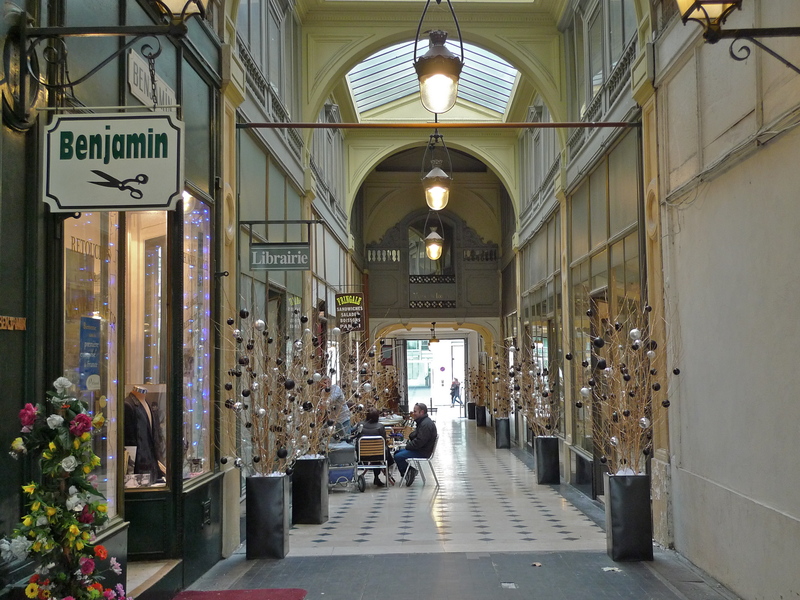 Charpentier was charged by the people who owned the Société du passage Jouffroy with designing and building a Galerie, a passage couvert, between the Place de la Madeleine and the rue Boissy d’Anglais, the Galerie de la Madeleine. Work began on the Galerie in 1840 and it was opened in 1846. At 53 metres long and 4 metres wide the Galerie de la Madeleine was not the biggest of the nineteenth-century passages couverts but it was in a prime location and to ensure success location was everything. 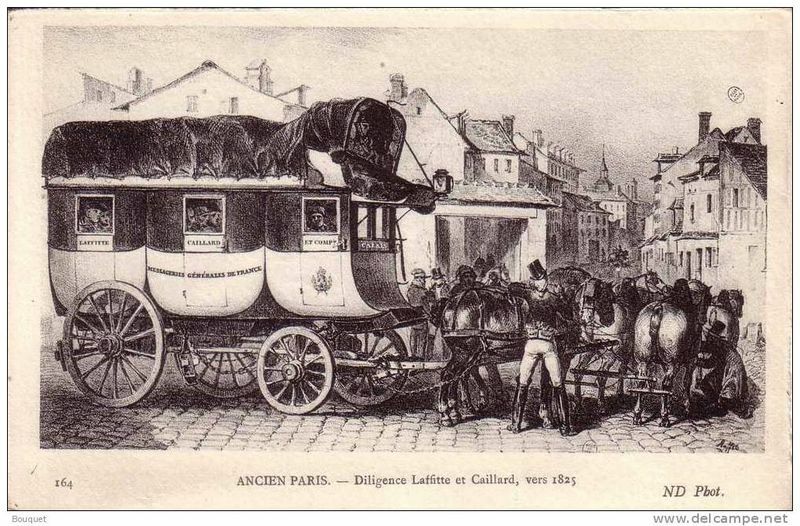 As well as being in a very fashionable part of Paris, the adjoining rue Boissy d’Anglais was a terminus for the early nineteenth-century stagecoaches providing a regular supply of eager customers with money to spend. There was also a very popular restaurant next door, Lucas-Carton, an English style tavern famed for its cuts of cold meat and puddings, which attracted visitors to the Galerie. This restaurant is sill there. Now named Senderens – Lucas-Carton, it’s noted for its Novelle Cuisine and no doubt still attracts customers to the Galerie de la Madeleine. The demise of the stagecoaches signalled the decline of the passages couverts and although some of them disappeared altogether, others struggled on and survived and, like the Galerie de la Madeleine, have been preserved retaining some of their former elegance. But today, although now listed as a national monument, the Galerie de la Madeleine faces a further threat. Over the years, property prices have exploded and some of today’s small businesses and artisans have been forced to leave. 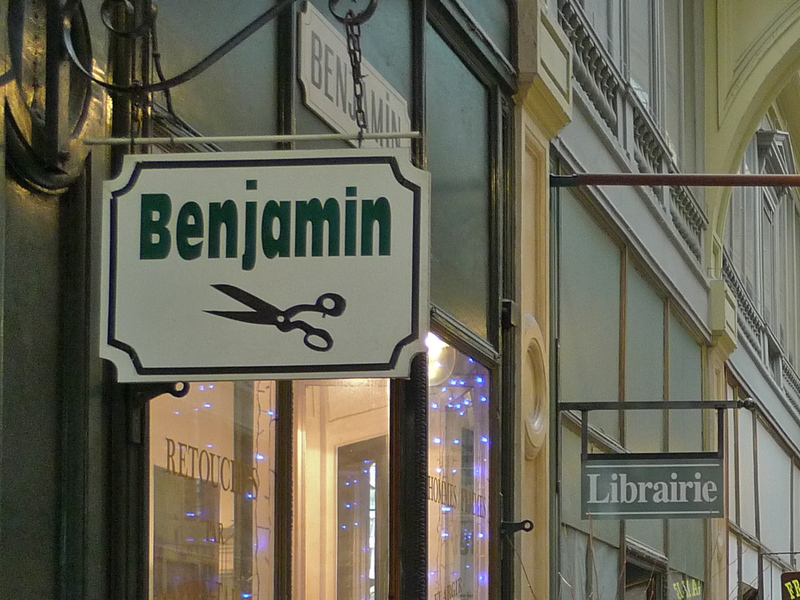 One business in the Galerie that has survived and continues to flourish is Chez Benjamin, a tailor’s shop. 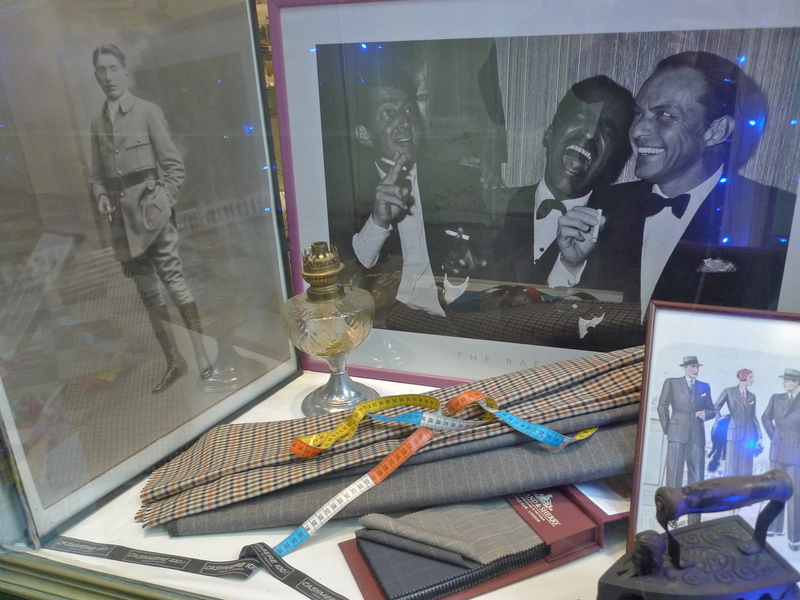 The window display with an antique flat iron and pictures and engravings of fashion from the last century sets the tone of this “old fashioned” tailor’s shop. Catering for both men and women’s tailoring needs, Monsieur Benjamin and his wife run this wonderful shop with impeccable service and style. 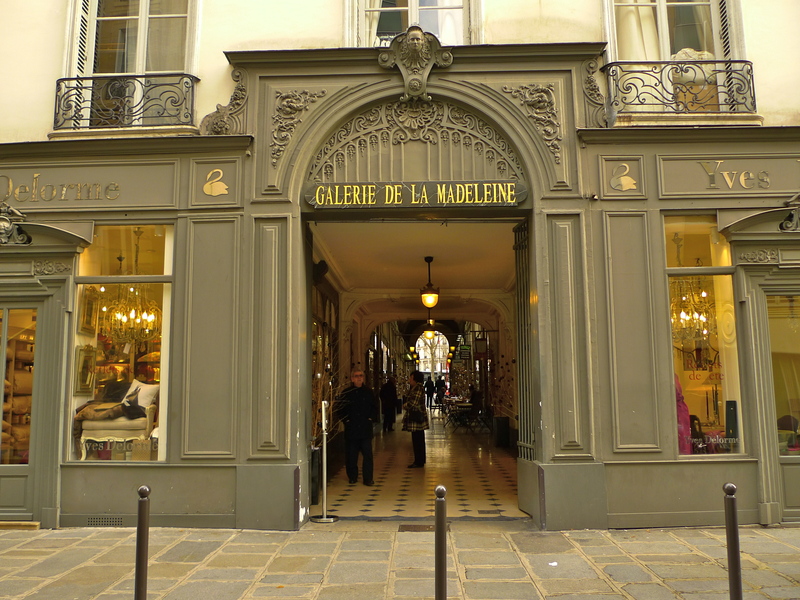 There are other boutiques in the Galerie de la Madeleine but there are empty spaces too. On the day I went to the Galerie there were one or two people sitting outside the cafés but most of the people there were passing through, using it as a short cut between the Place de la Madeleine and the rue Boissy d’Anglais, with very few of them even stopping to look in the windows let alone going into the boutiques. I couldn’t help wondering what the future holds for the Galerie de la Madeleine. THE PASSAGE DU PRADO makes its way into my series about the surviving Parisian passages couverts by stealth rather than by virtue. 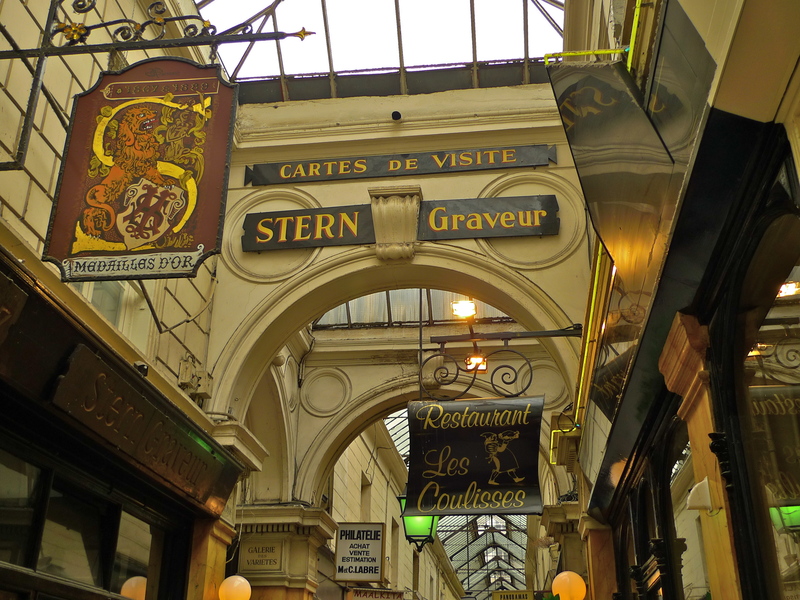 Built in 1785, it might claim to be the oldest of the passages couverts in Paris – but it isn’t. It was indeed built in 1785 but it was originally an open-air passage like many others built around the same time. It only became covered in 1925. Its owners, inspired by the national Museum of Madrid, named it the Passage du Prado and it enjoyed some success in the 1930’s but, despite the best efforts of Les Amis du Passage du Prado, it looks pretty sorry for itself today. About the only thing to commend this passage are the Art Deco style buttresses made of wood and plaster attached to the glass roof which remain in good condition despite dating from 1925. 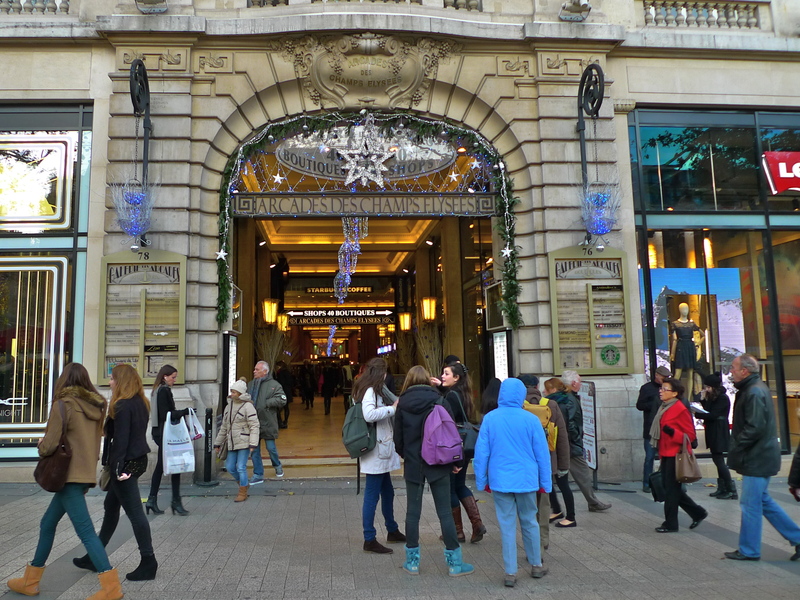 The Passage du Prado used to host mainly wholesale clothes retailers but today it is home to a selection of African hairdressers, a hotel, cafés and an assortment of individual businesses. IT ALWAYS SEEMS to me, that the Passage du Bourg-l’Abbé suffers a little from standing in the shadow of its larger cousin, the Passage du Grand-Cerf, which is just across the Rue Saint-Denis. 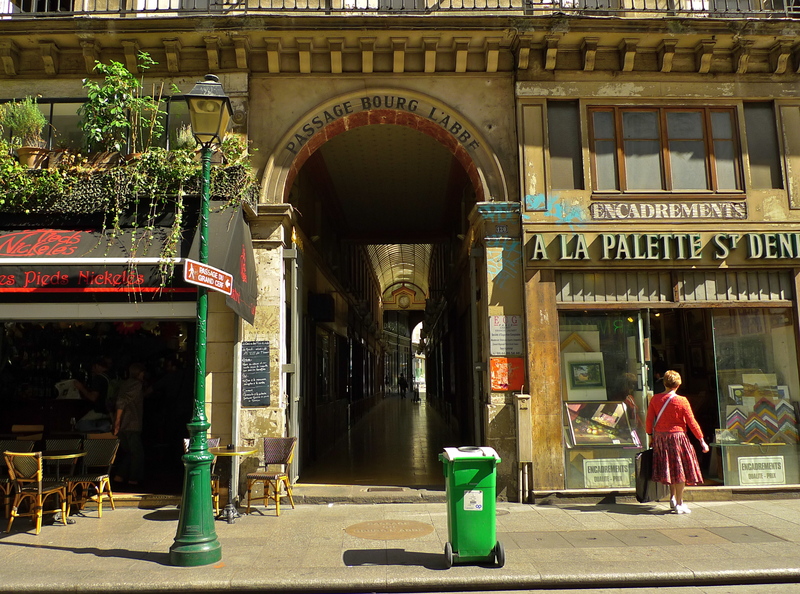 The Passage du Bourg-l’Abbé was built in 1828 by Auguste Lusson and it was designed to continue the line of the Passage du Grand-Cerf to the Rue Saint-Martin by linking up with the open-air Passage de l’Ancre. Thanks to Baron Haussmann’s transformation of Paris in the Second Empire, the Passage du Bourg-l’Abbé lost its eastern end to make way for the Boulevard Sébastopol in 1854. 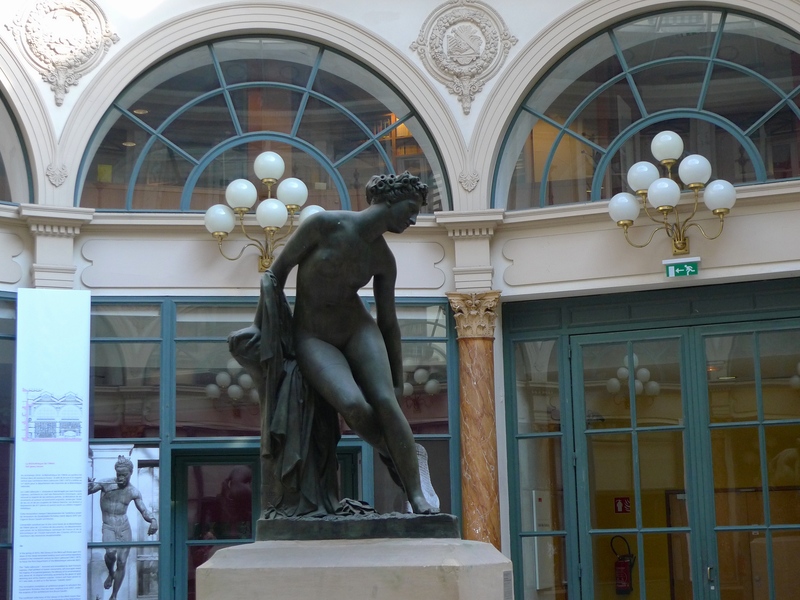 It was in 1879 that Henri Blondel, architect of the Bourse du Commerce, the French Stock Exchange, tidied up the amputated eastern end of the passage by building the Empire style entrance (shown above) with its two caryatides sculpted by Aimé Millet. 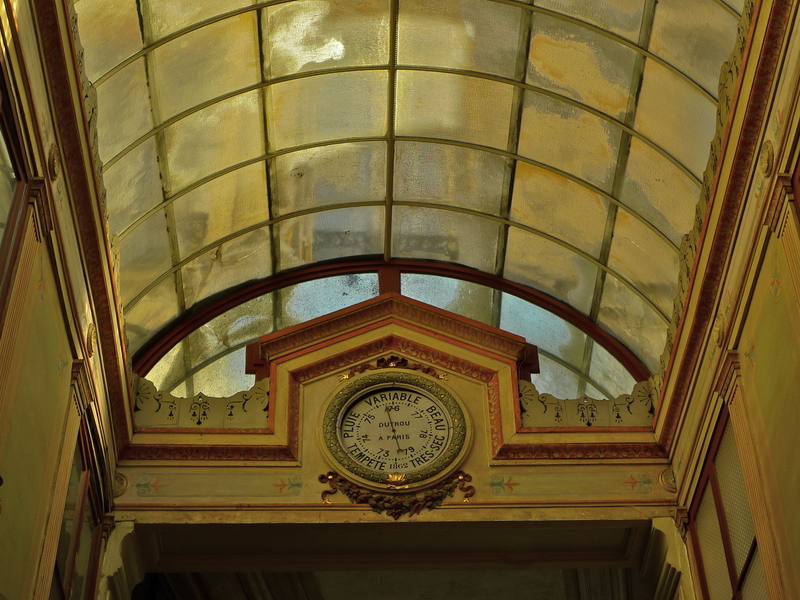 The arched glass roof is impressive as are the clock and the barometer at either end of the passage. The Passage du Bourg-l’Abbé has had a chequered history. Thanks to Baron Haussmann it’s not as long as originally intended whereas its cousin, the Passage du Grand-Cerf, is the largest of all the Parisian passage couverts. 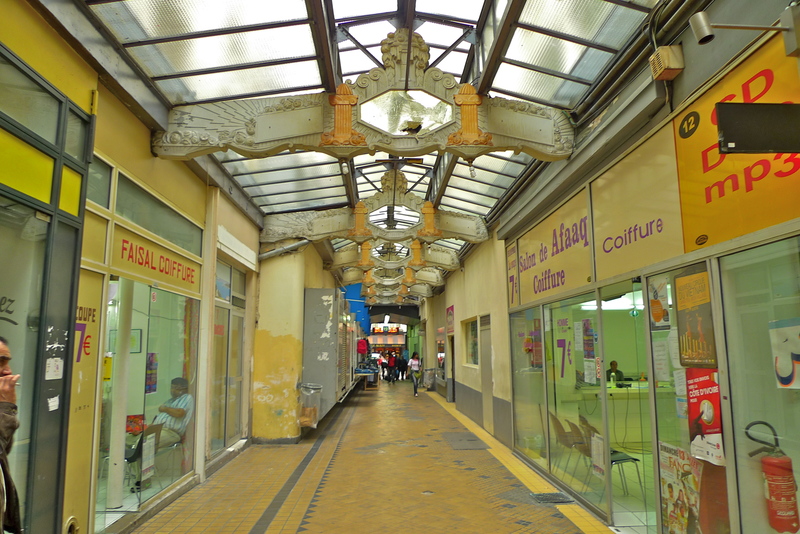 Over many years, the Passage du Bourg-l’Abbé became run down and, not all that long ago, it was ravaged by fire. But today, it’s been restored and although still smaller than it’s cousin across the street it is equally as elegant and home to thriving niche businesses. 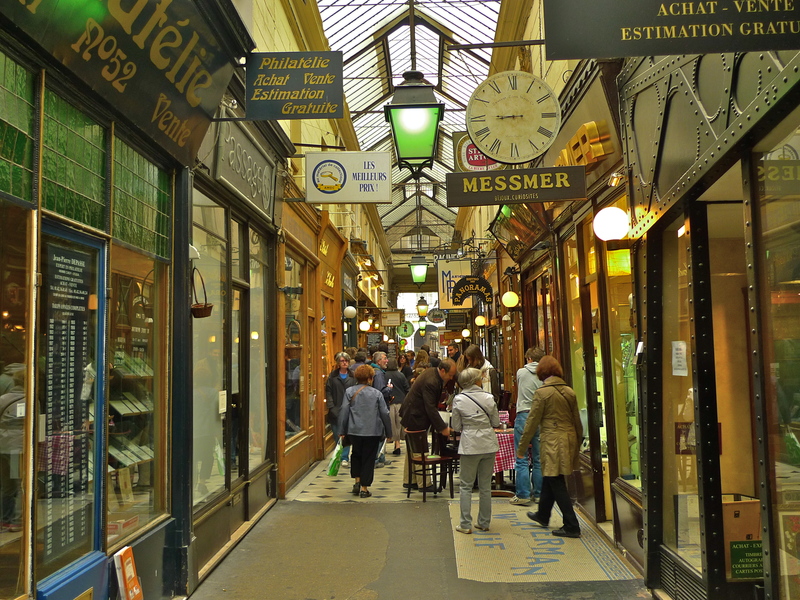 THE PASSAGE DES PANORAMAS was opened in 1799, which makes it the oldest of the passages couverts in Paris. It takes its name from the two round towers that once stood outside in the Boulevard Montmartre. Each tower contained giant circular frescos, or Panoramas, which were very popular at the time. The passage was built on the site of the former Hôtel Montmorency in the prestigious 2nd Arrondissement. The site became even more prestigious when the Théâtre des Variétés was built next door in 1807. In 1865, Jacques Offenbach’s La Belle Hélène premiered here. The theatre is now listed as an historical monument and it’s been fully restored to its original décor. 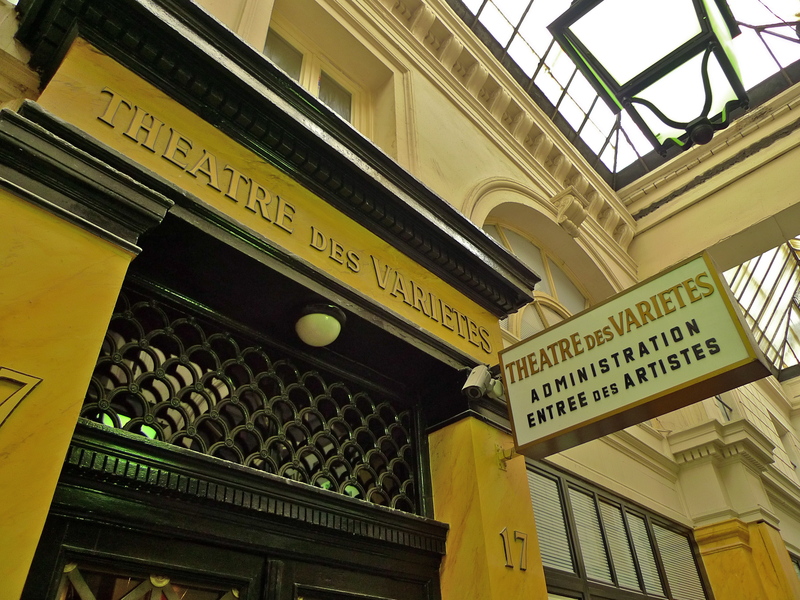 The artist’s entrance to the theatre opens directly onto the Passage des Panoramas. The passage comprises sixty one-story houses with boutiques on the ground floor. It was here in 1817 that the first tests of gas lighting took place. In 1831, the rotundas were demolished. In 1834 the passage was renovated and the architect Jean-Louis Grisart created the additional galleries, Saint-Marc, Variétés, Feydeau and Montmartre. Today, the Passage des Panoramas has retained much of its authenticity. 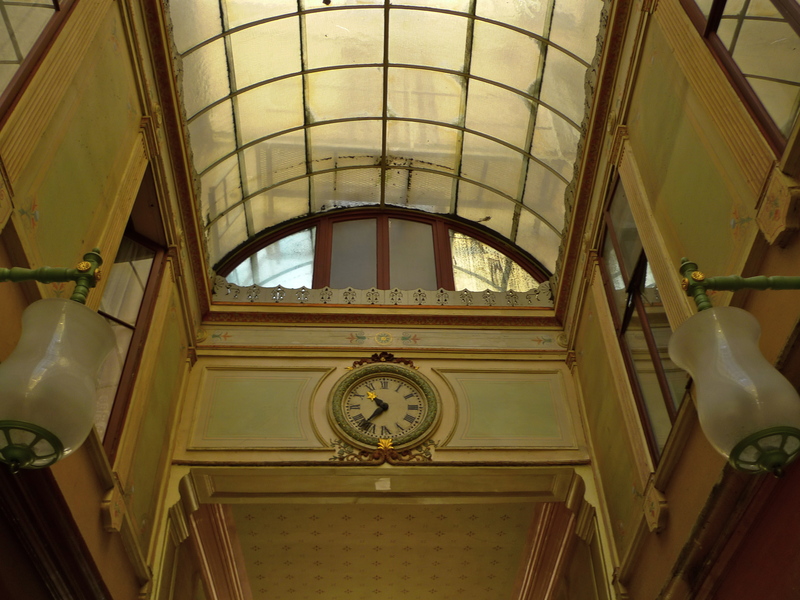 L’Arbe à Cannelle, today a restaurant, retains the decorated ceiling, columns and mirrors from the original chocolatier Marquis. 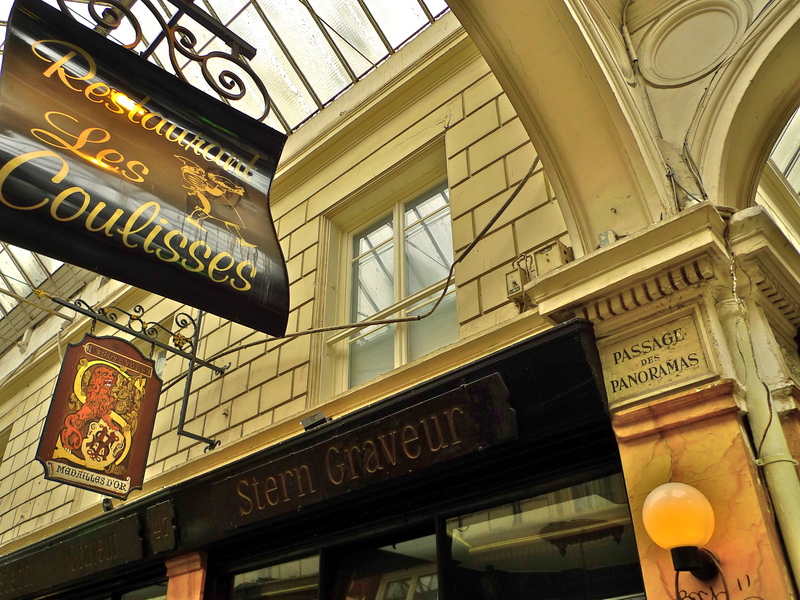 In 1849, the renowned graveur (printer and engraver) Maison Stern rented premises in the Passage des Panoramas. These premises are now listed as an historical monument but alas Maison Stern left some time ago. 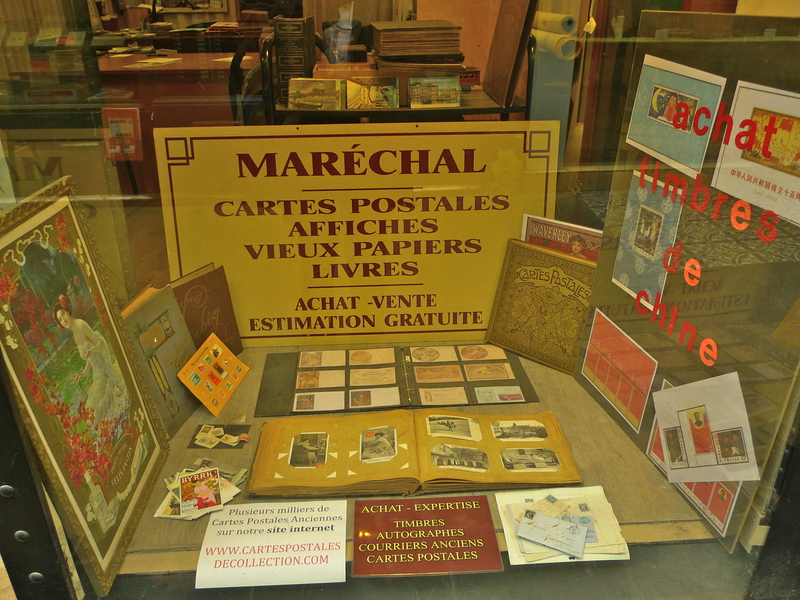 Today the passage is renowned for its postcard and philately boutiques. There’s even an autograph shop. Like all the passage couverts in Paris, the Passage des Panoramas enjoyed huge early success but as competition appeared decline set in. Today, the passage retains its former nineteenth-century ambience and it seems to be as busy as ever. 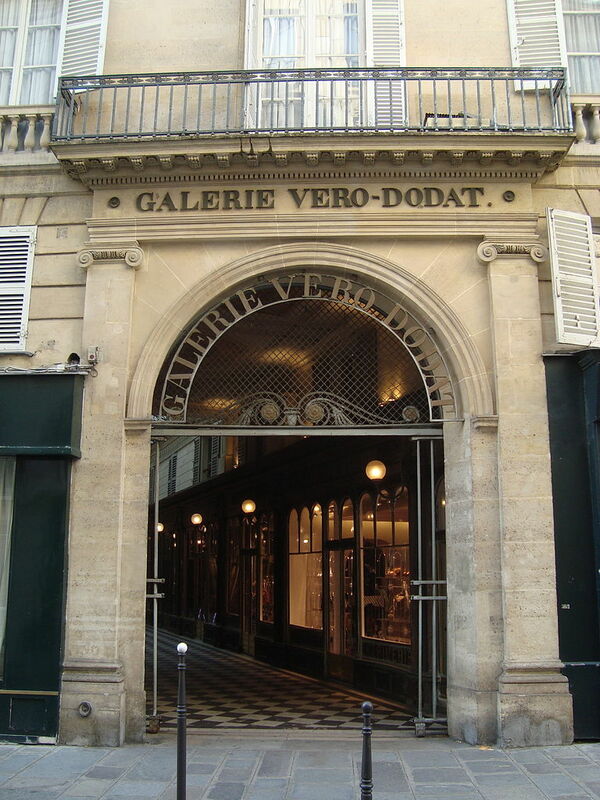 THE GALERIE VERO-DODAT is another of the surviving passages couverts in Paris. It’s also another example of Restoration property speculation in the nineteenth-century. During the post-revolutionary Restoration period speculation was rife in Paris and some people became very rich indeed. One example is Benoit Véro, a butcher, who by 1840 had turned 4,000 Francs inherited from his wife’s parents into a fortune of some 850,000 Francs. 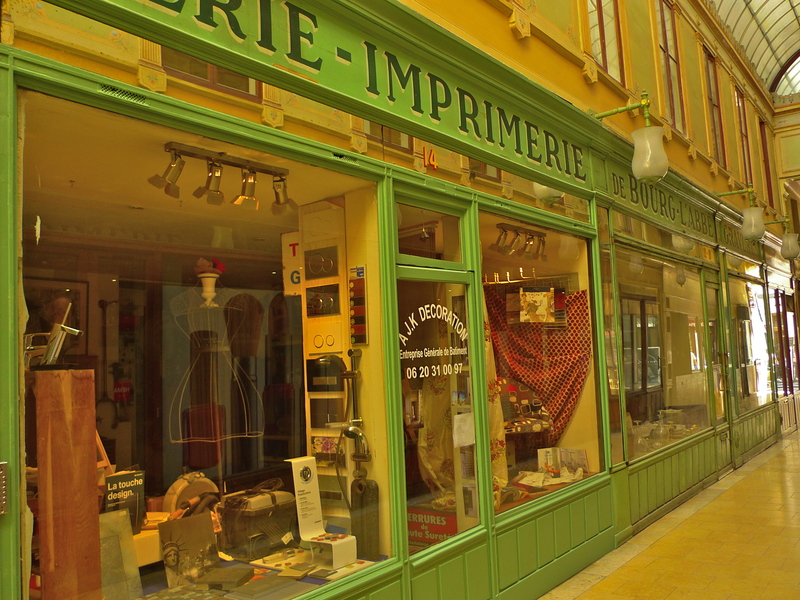 In 1818, Véro had a shop at the corner of the Rue Montinesque in the 1st arrondissement. The following year he bought the small hôtel Quatremère in the Rue Bouloi opposite his shop. This was the genesis of the Galerie Véro-Dodat. Véro teamed up with his neighbour, the financier Dodat and together they bought another parcel of real estate in the Rue Jean-Jacques Rousseau. In 1822, Véro and Dodat began connecting the two properties with a passage effectively providing a shortcut from the commercial district of Les Halles to the elegant Palais Royal. 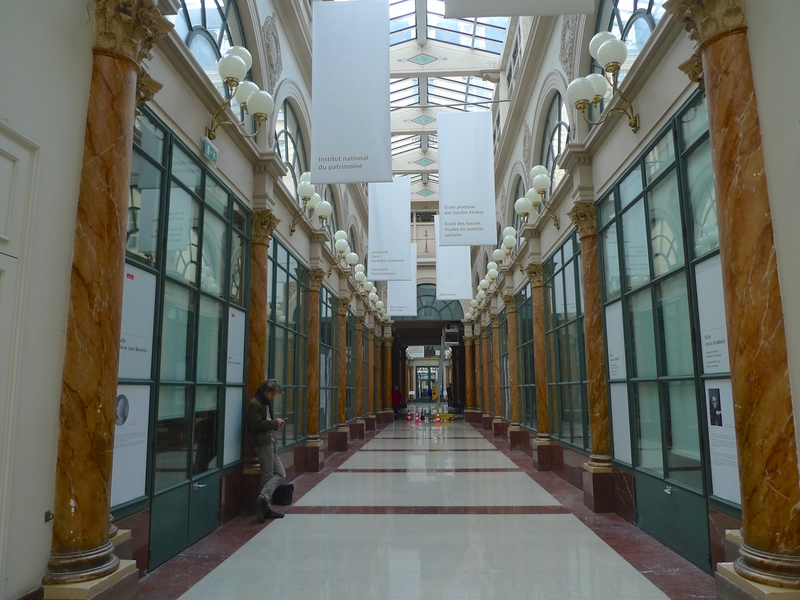 Into this space they created the nineteenth-century shopping mall, the Galerie Véro-Dodat, which eventually opened in 1826. The venture was a success. Véro and Dodat had proved that location is everything. The entrance in the Rue Jean-Jacques Rousseau just happened to be the terminus of the mail coaches, Messageries Laffitte et Gaillard. The passengers waiting for, or alighting from, the coaches provided eager customers ready to sample the magasins à la mode. By 1837, Véro and Dodat held two hundred shares in the Galerie Véro-Dodat with each share valued at ten thousand Francs! 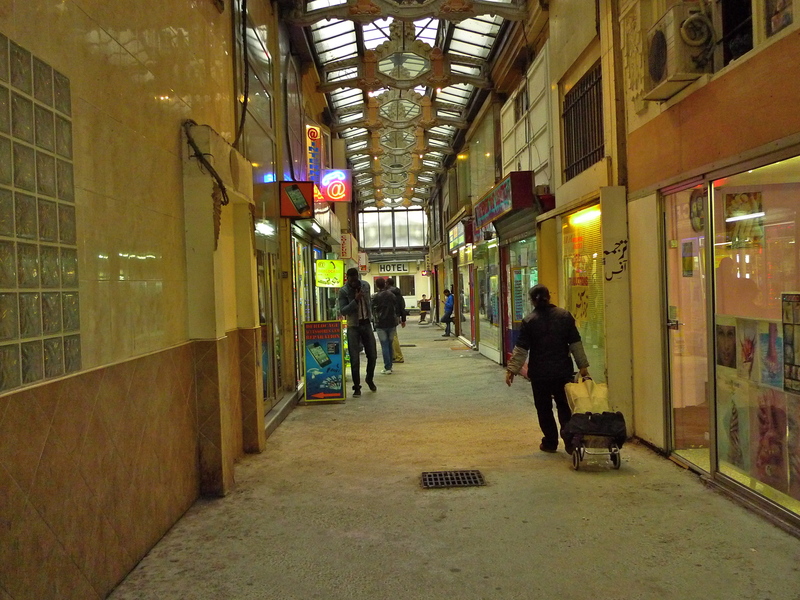 Like the other passage couverts in Paris, the early flush of popularity eventually passed. For the Galerie Véro-Dodat the decline began during the Second Empire with the demise of the Messageries Laffitte et Gaillard. 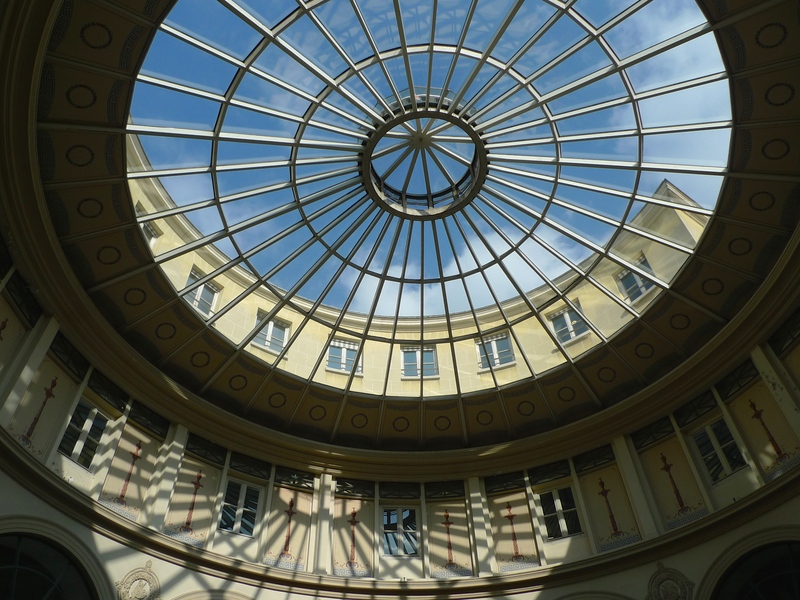 It wasn’t until 1997 that the Galerie was restored to its former nineteenth-century neo-classical glory complete with its elegant shops specialising in antiques, objets d’art, art books and fashion accessories.